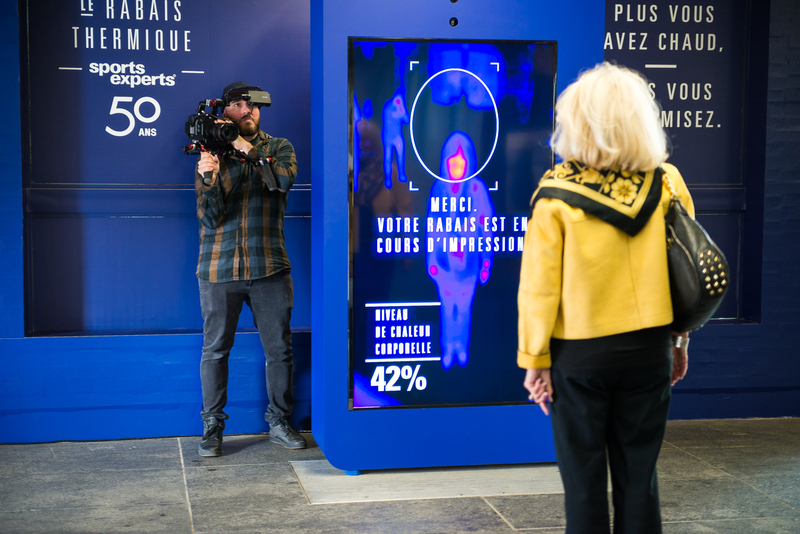 October 1, 2018, election night across Quebec: Astral presents a simulcast of CBC’s special coverage. 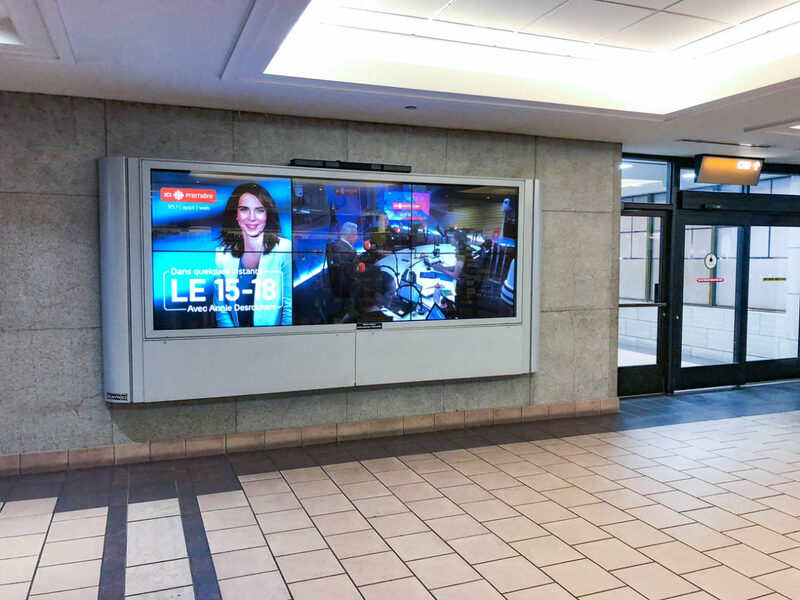 On screen, passers-by can see the show hosted by anchorman Patrice Roy, with static ads in the left-hand corner indicating live results. 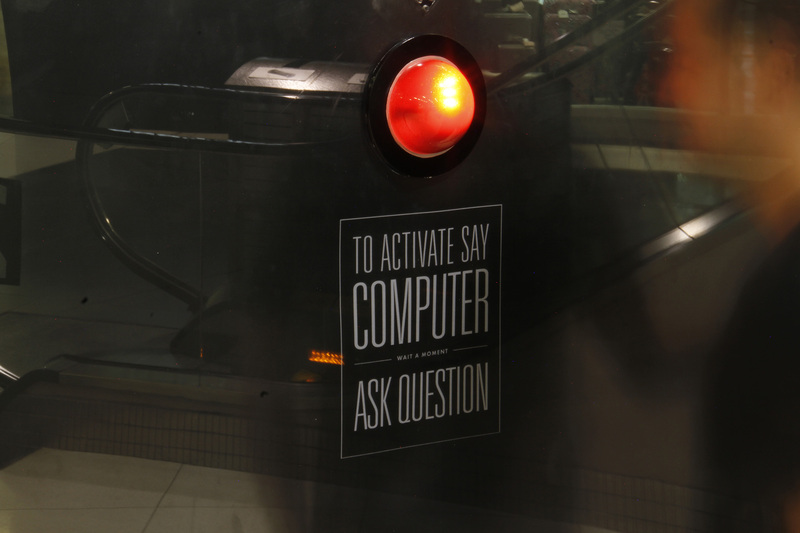 Because there’s no sound on the broadcast, subtitles are added to make sure everyone can understand what’s going on. 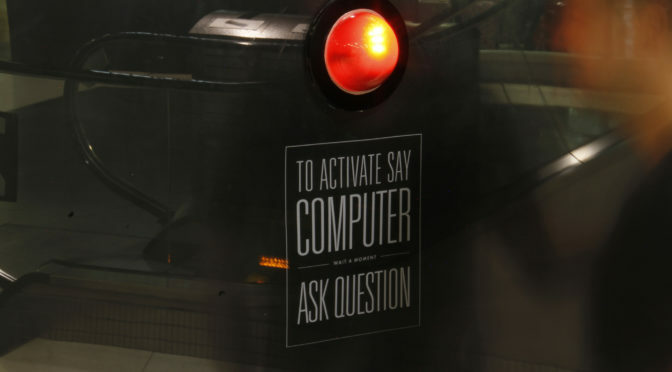 An innovative way to keep up with the latest news while waiting for the next subway train. 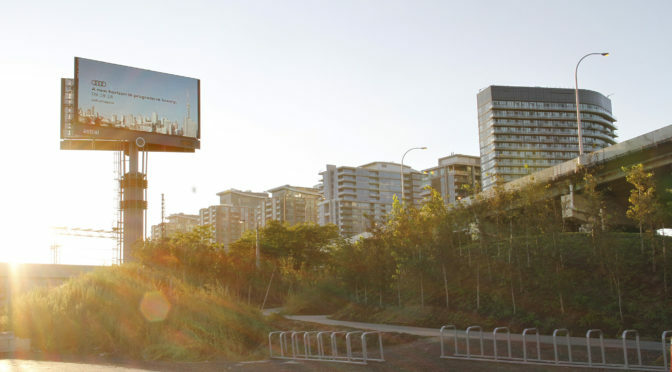 Sunrises and sunsets are the most photo-worthy moments of the day, not just because of their beauty, but also as symbolic representations of new beginnings and endless opportunity. 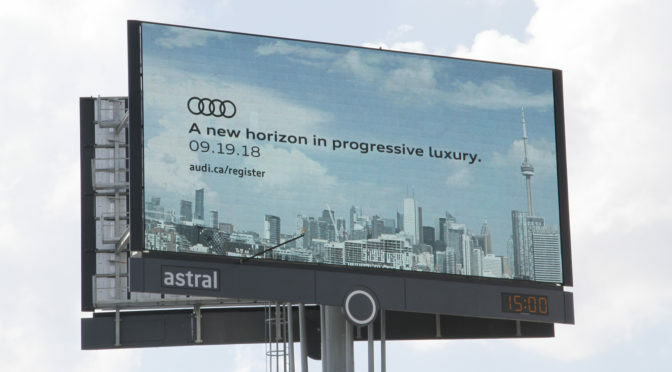 Audi wanted to tap into this imagery to tease the launch of its latest models, as a way to convey a sense of renewal. 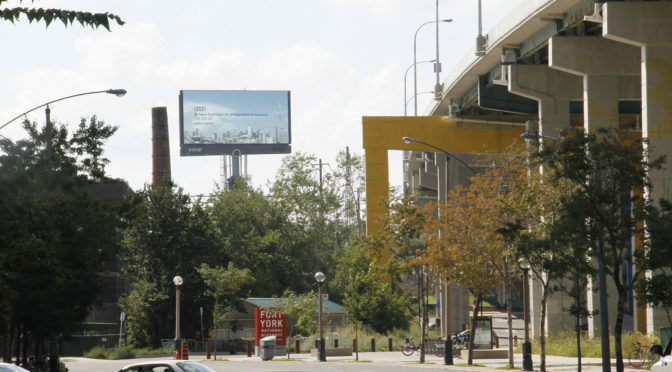 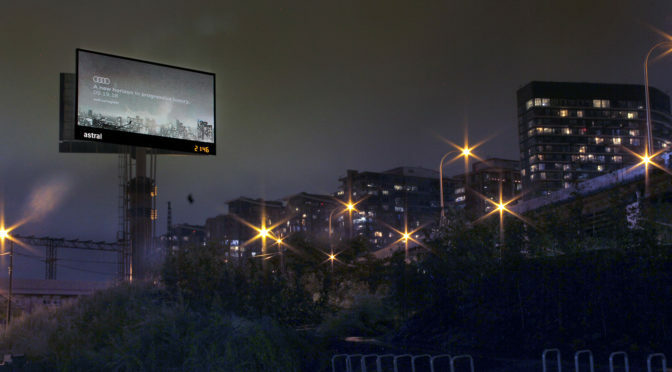 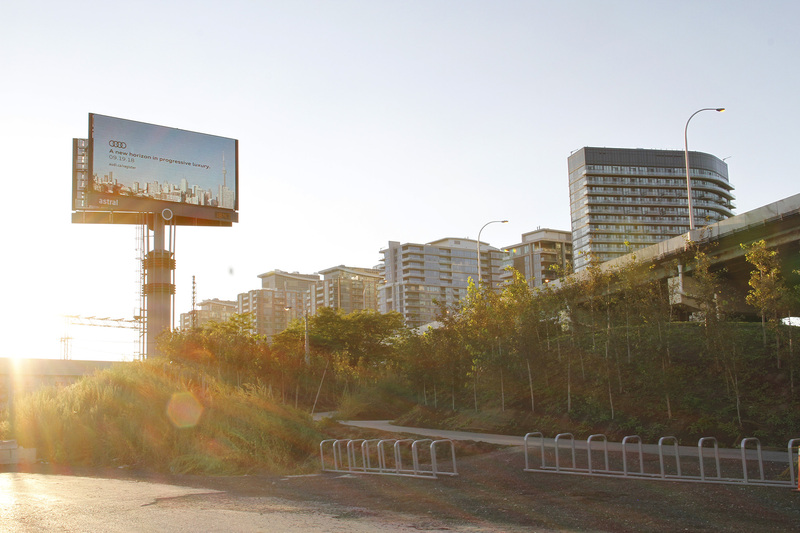 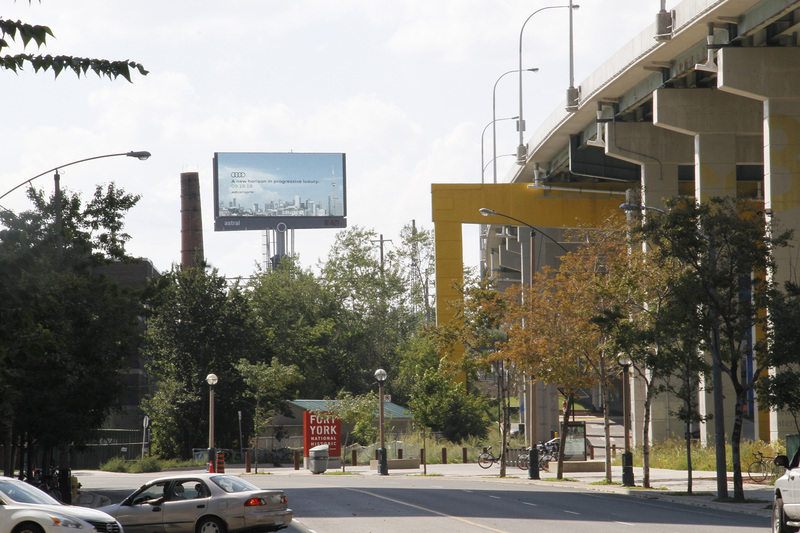 To accomplish this in a creative and eye-catching way, Astral installed a camera on a digital billboard, capturing the real-time city skyline in the background. 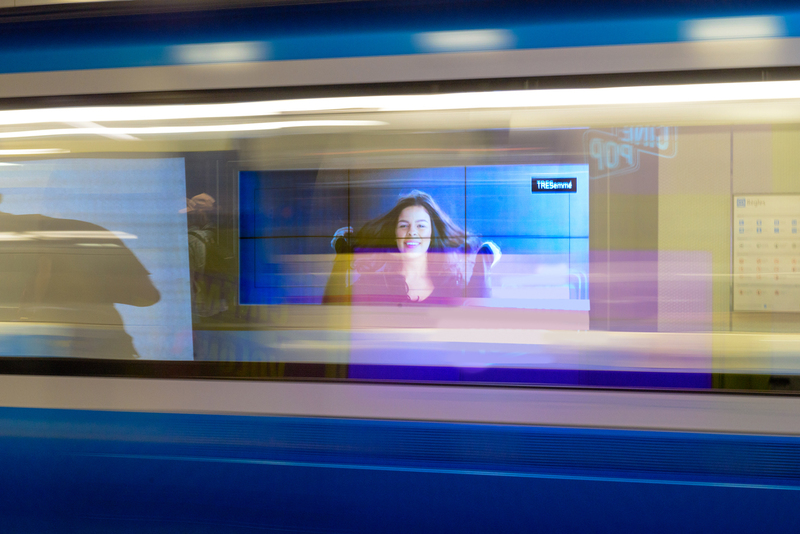 These images were updated regularly and overlaid with the campaign headline, promoting the launch events. 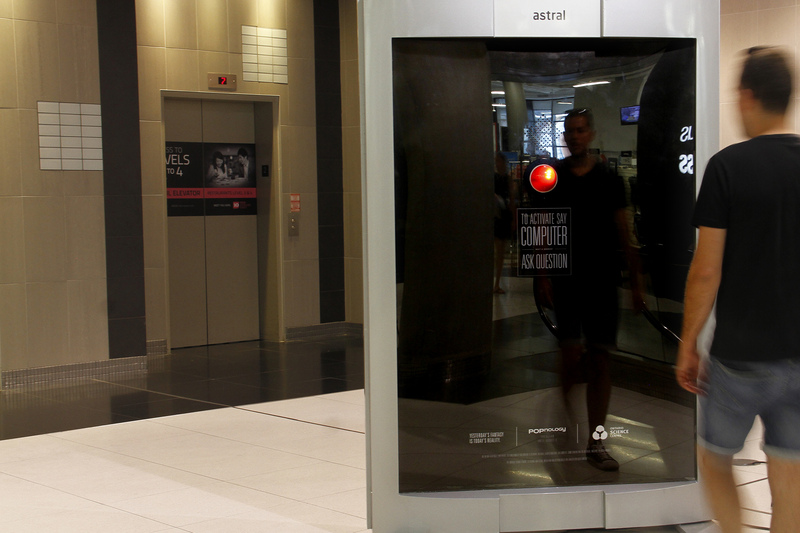 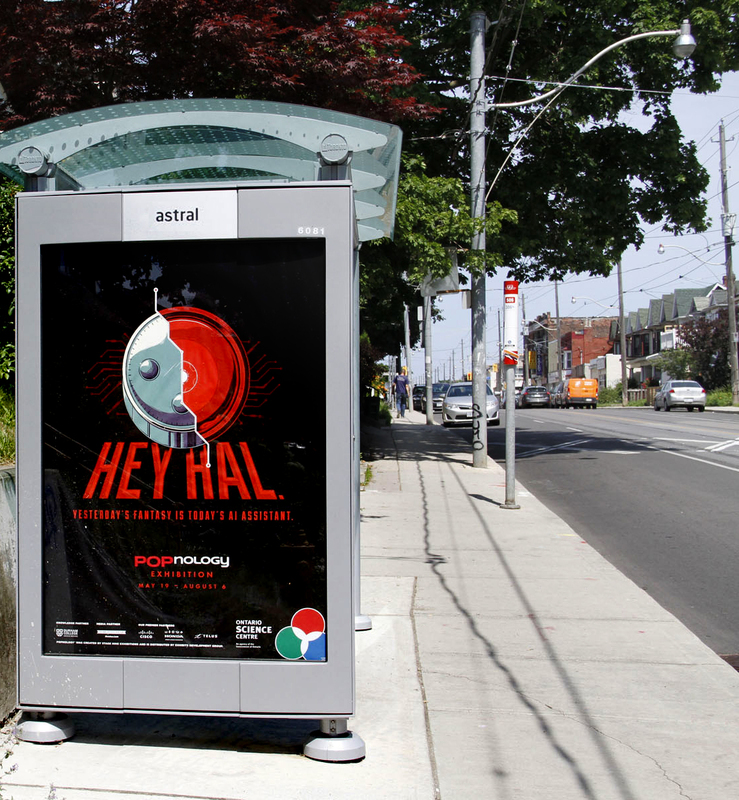 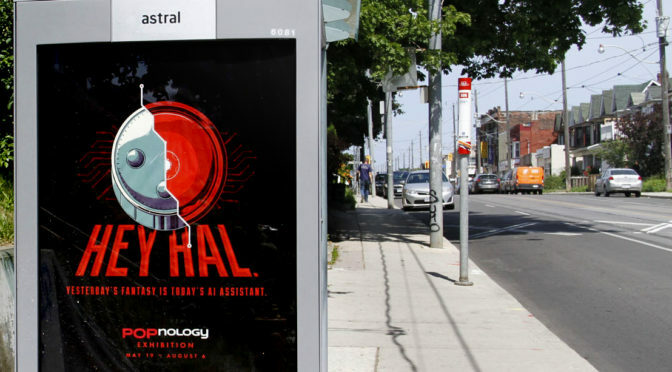 To promote the Ontario Science Centre’s Popnology exhibit, Astral built a special A.I. 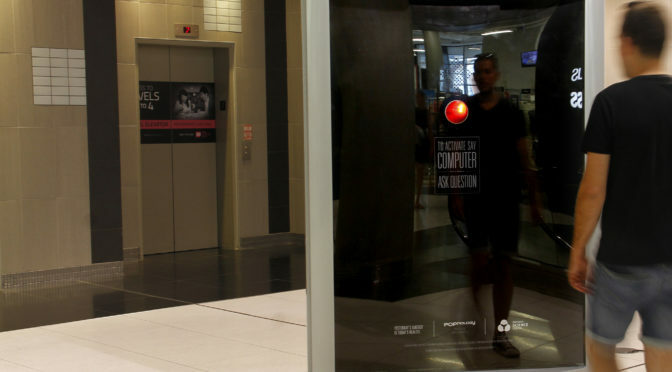 unit in the 10 Dundas building in downtown Toronto. 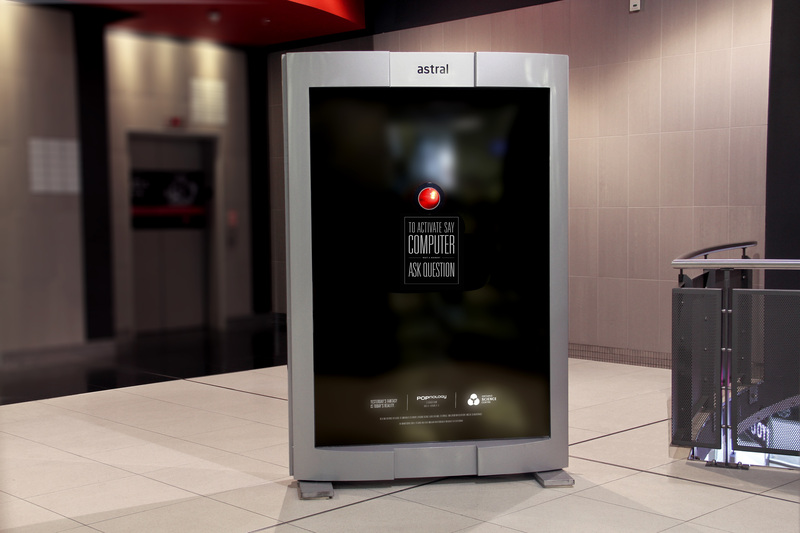 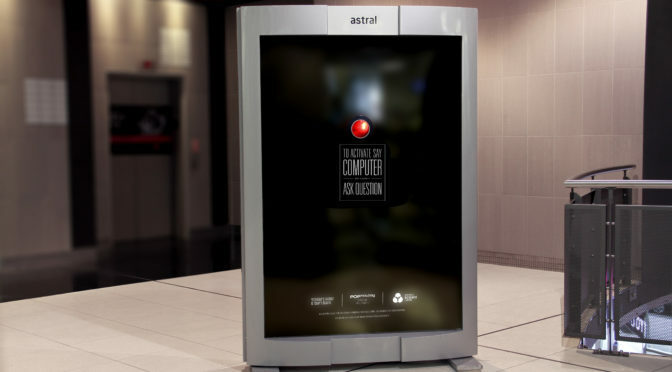 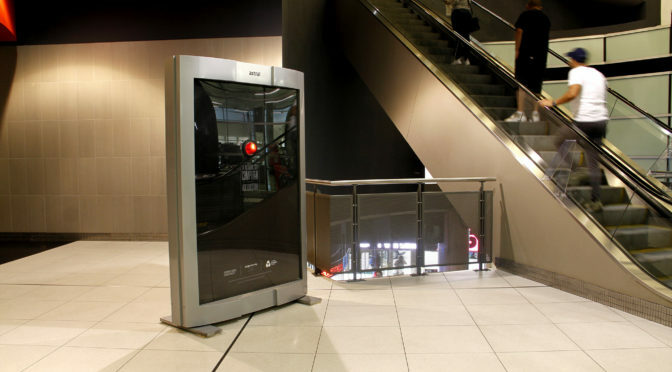 Inspired by HAL 9000 – the supercomputer from the movie “2001, A Space Odyssey” – the unit took questions from passers-by and provided answers referencing the exhibit’s focus on technology and its relationship to pop culture. 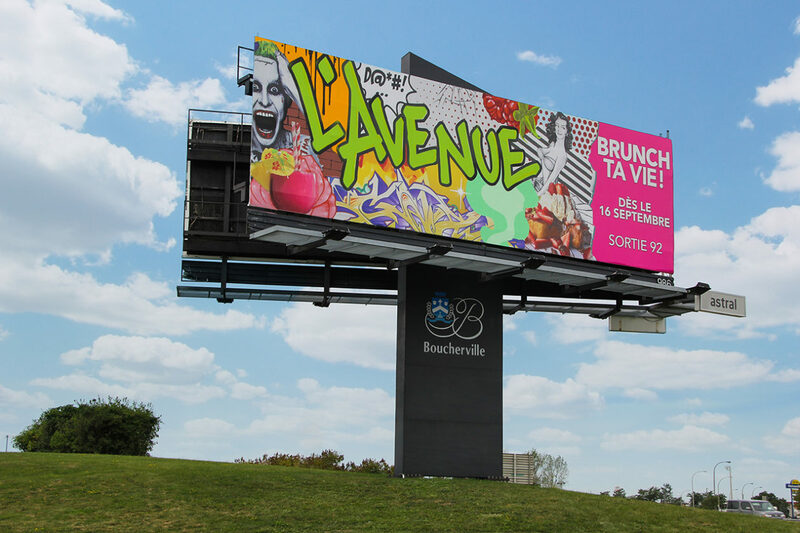 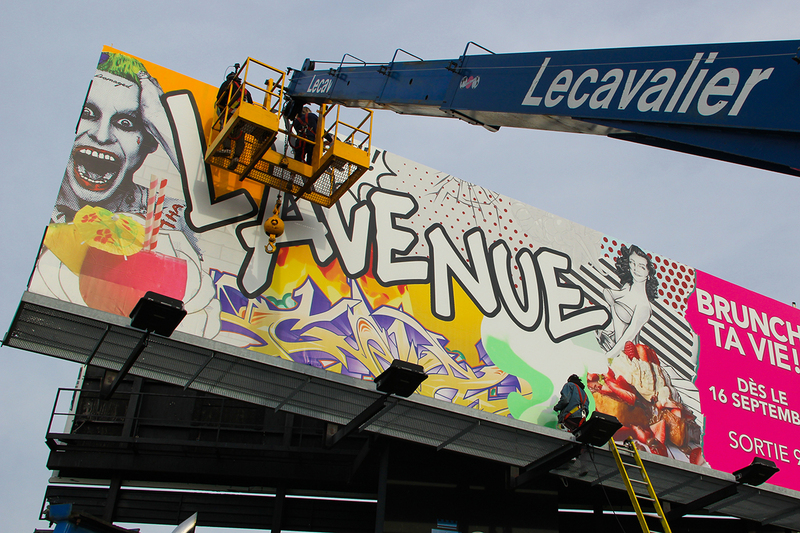 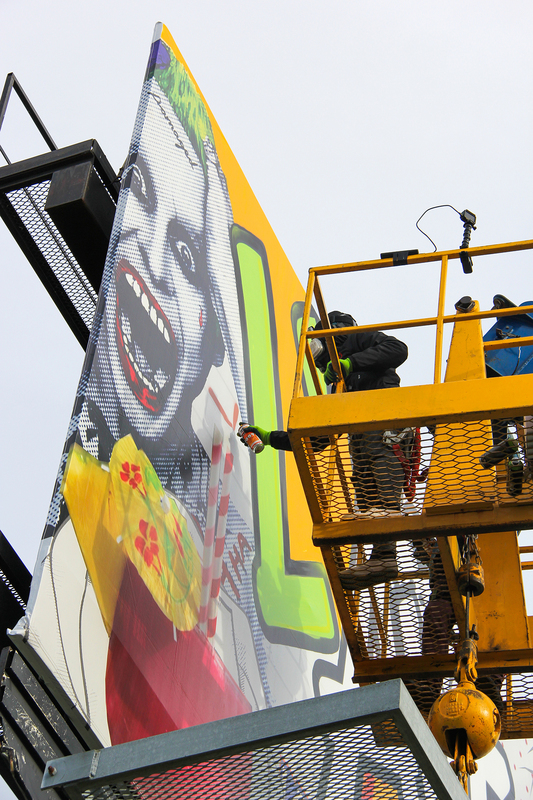 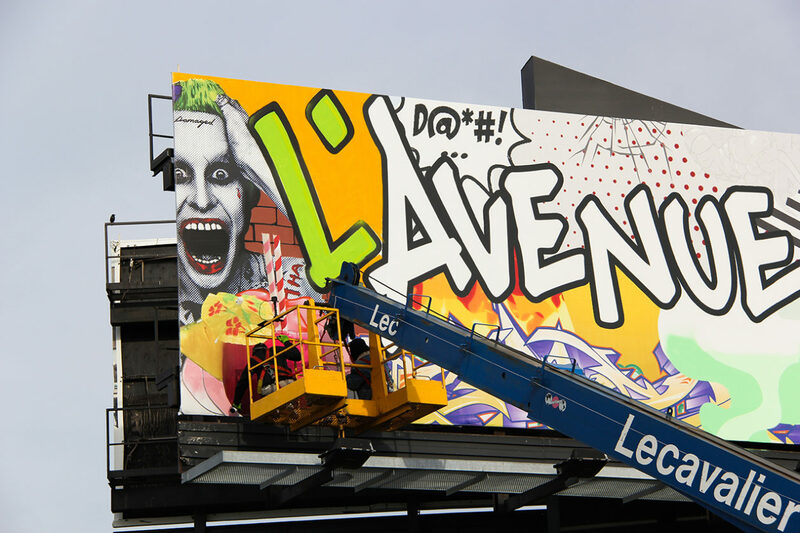 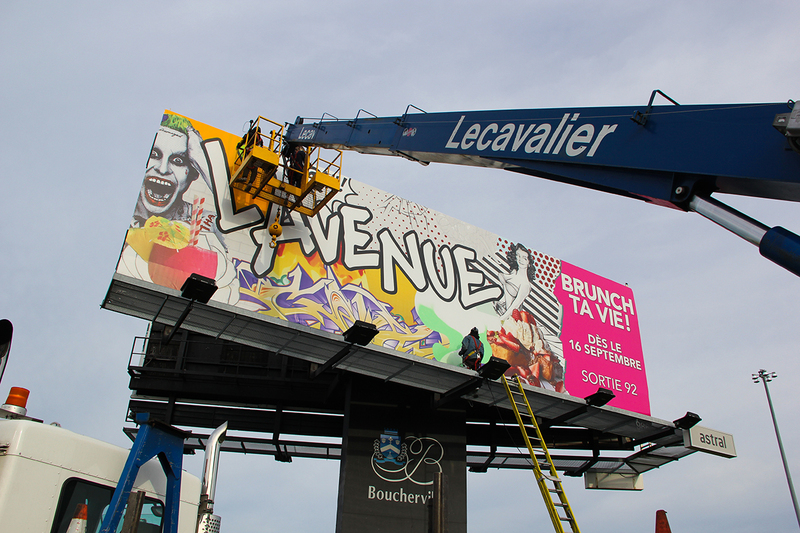 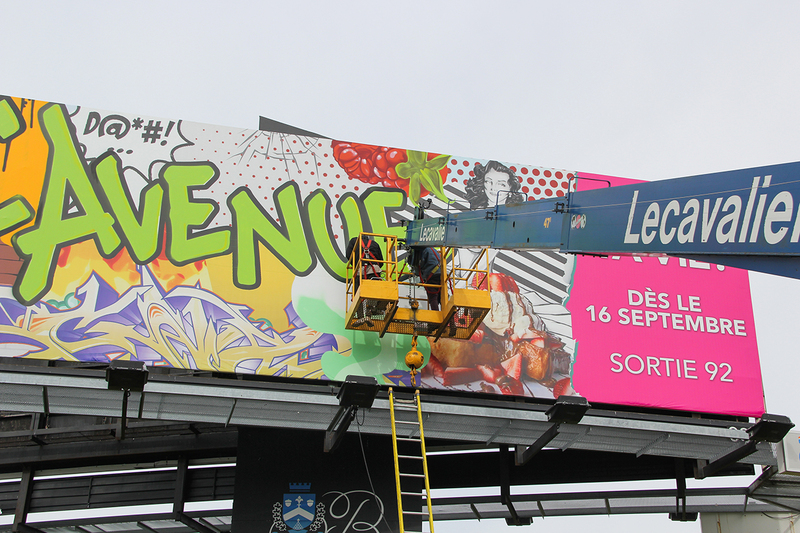 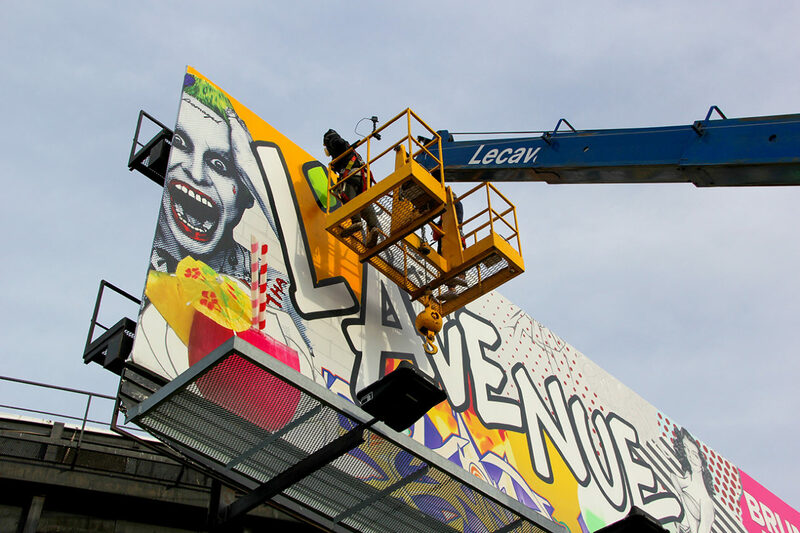 To promote the opening of its brand-new Boucherville franchise, L’Avenue restaurant wanted to showcase its unique style on one of our billboards. 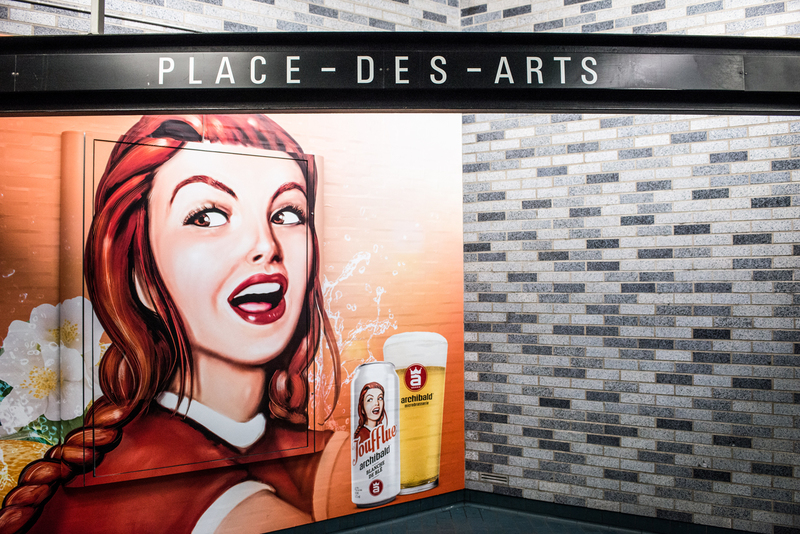 We invited the graffiti artists responsible for the restaurant’s interior design to reproduce this ambiance on a Superboard next to the new location’s nearest highway exit. 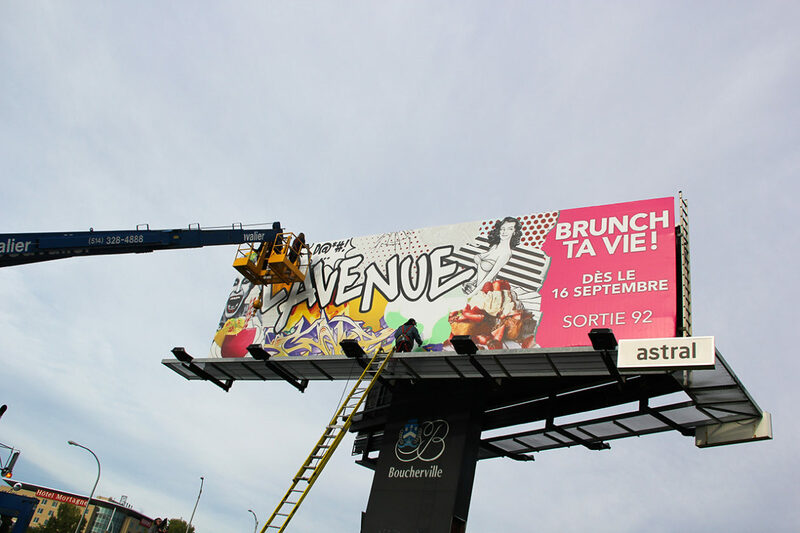 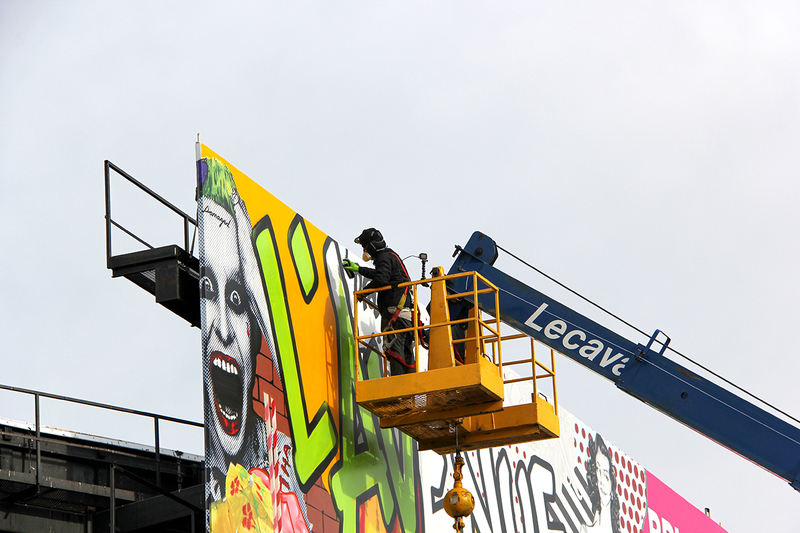 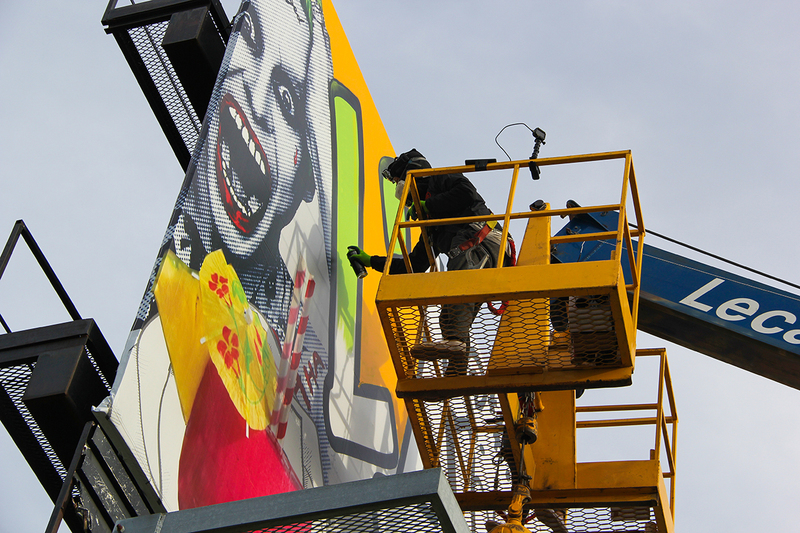 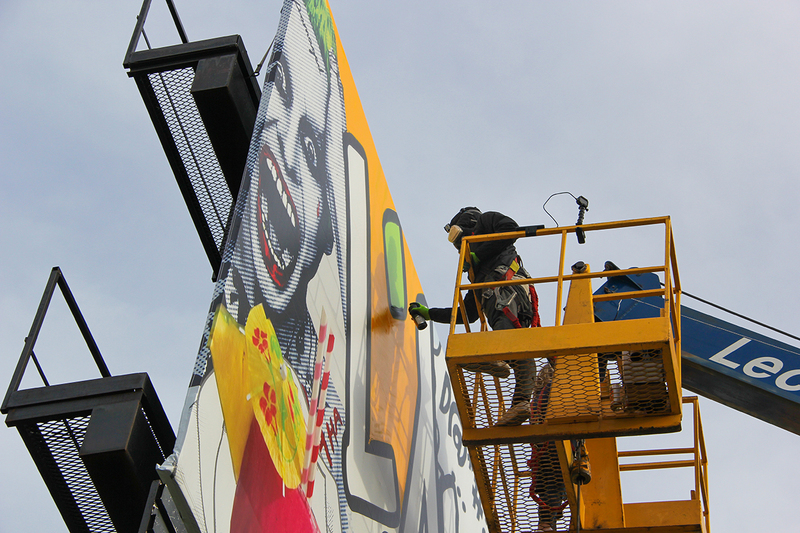 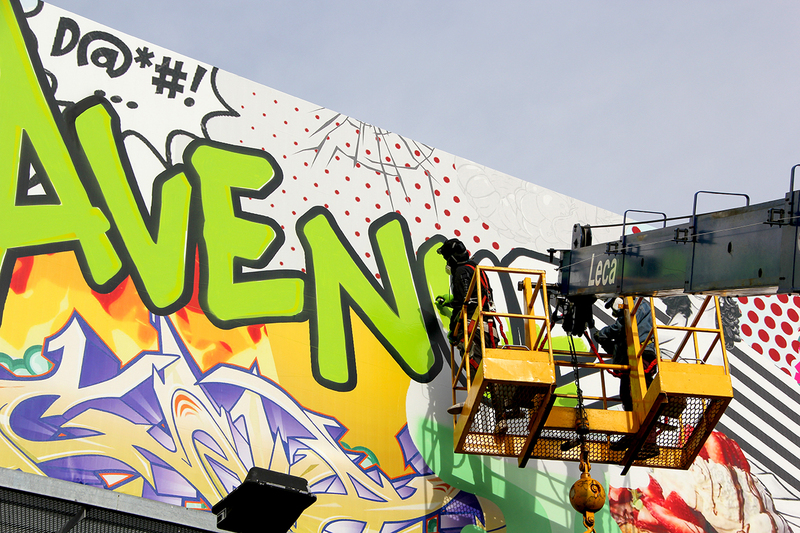 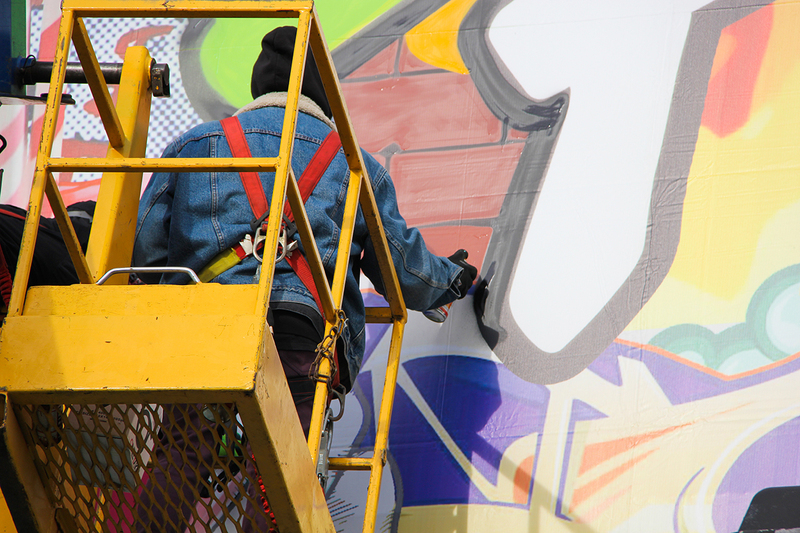 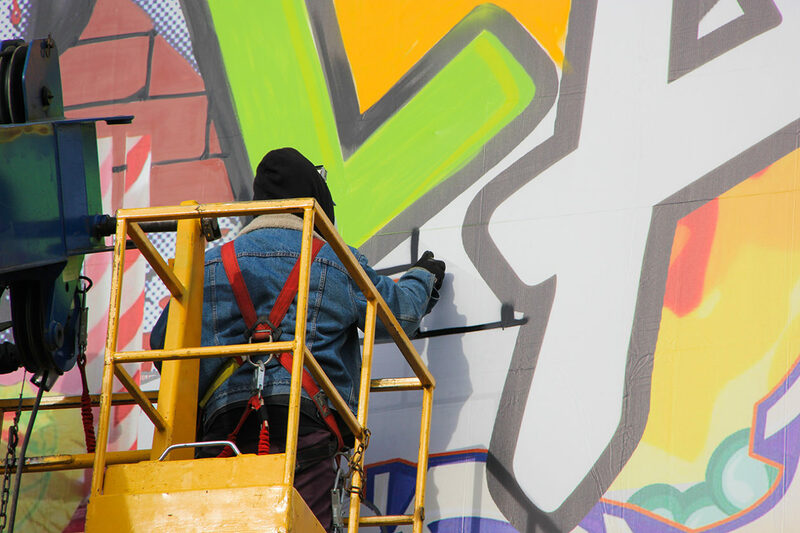 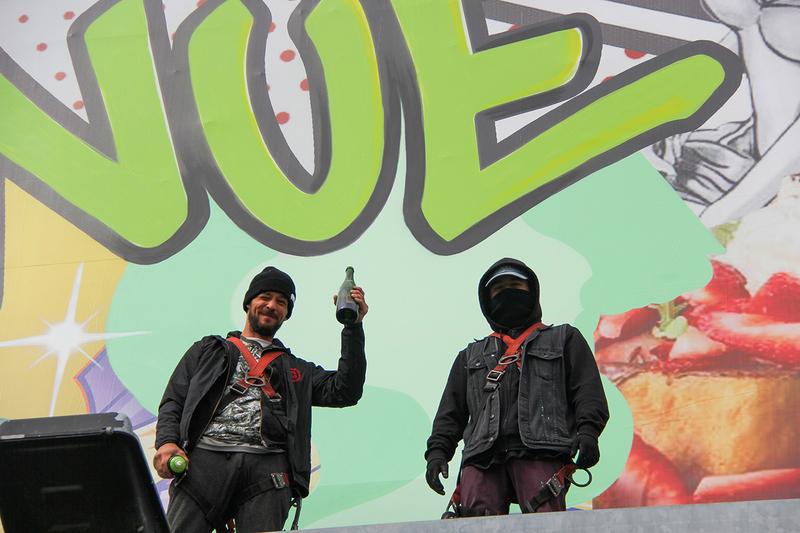 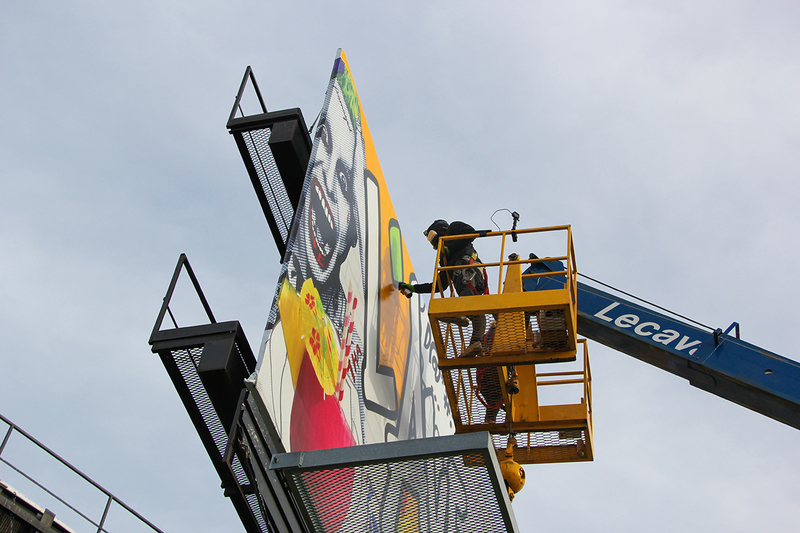 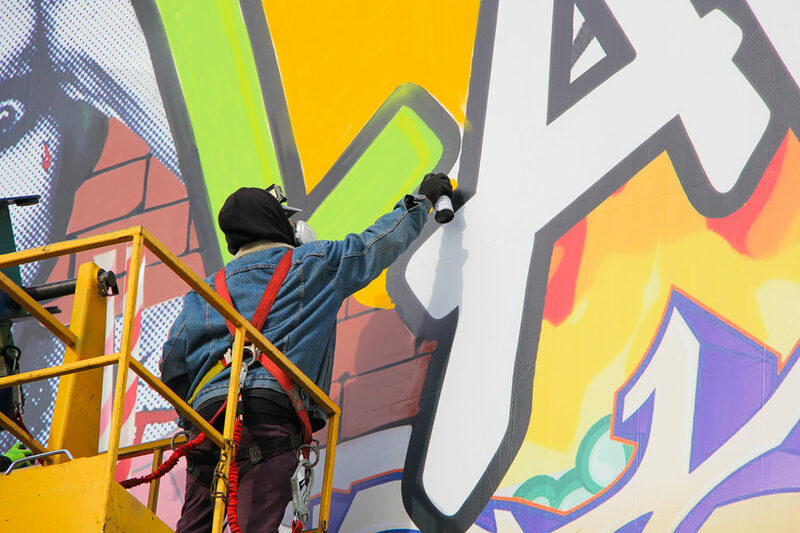 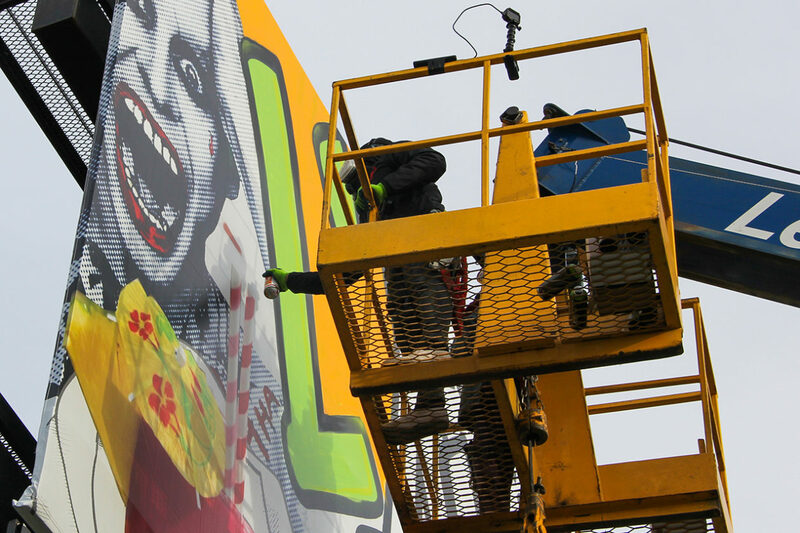 Early in the morning, the artists started painting their graffiti directly on the board, assisted by our Astral production team. 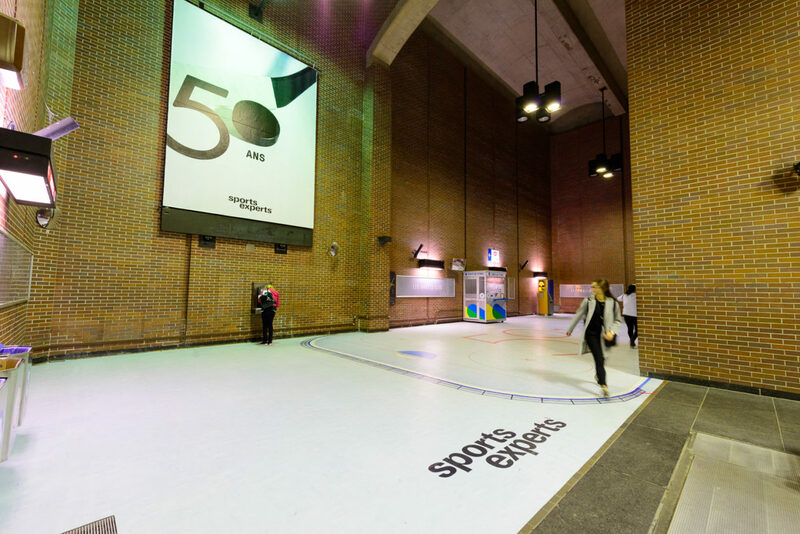 The result was completely off-the-wall – and totally spectacular! 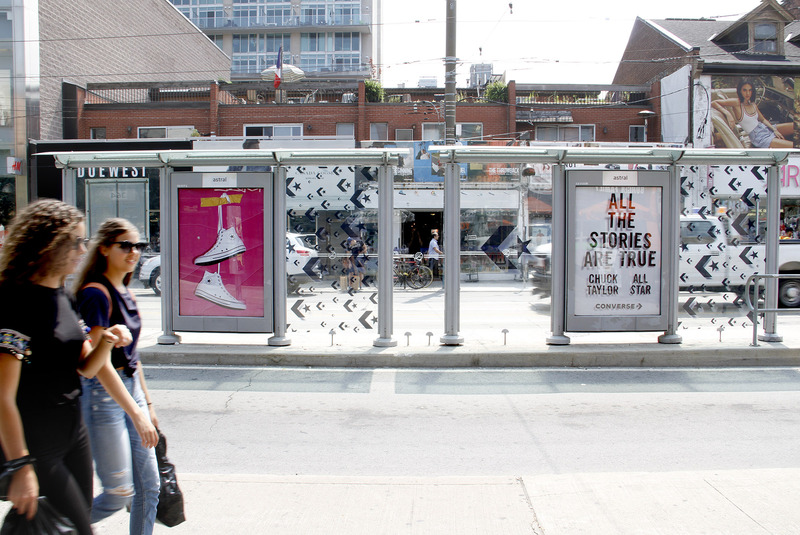 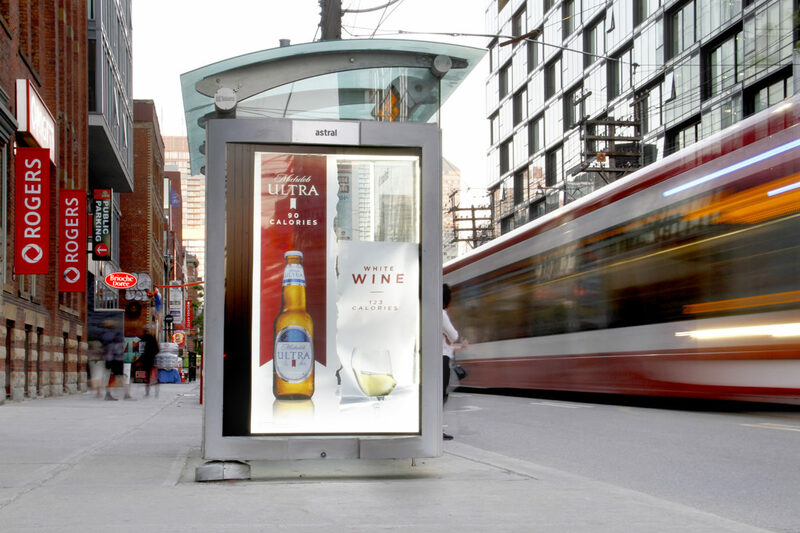 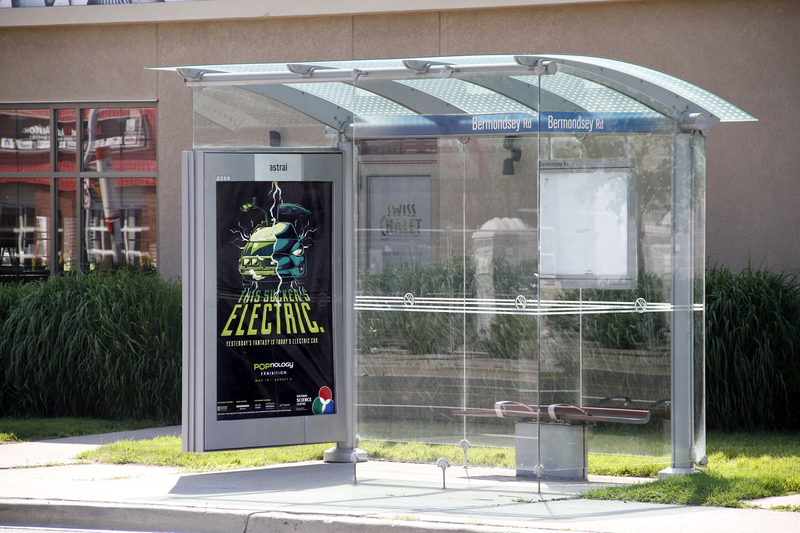 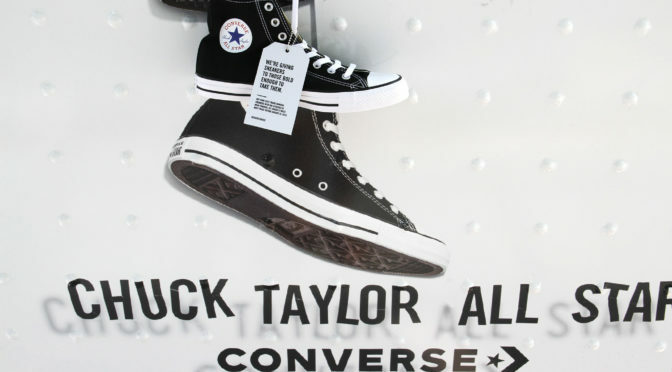 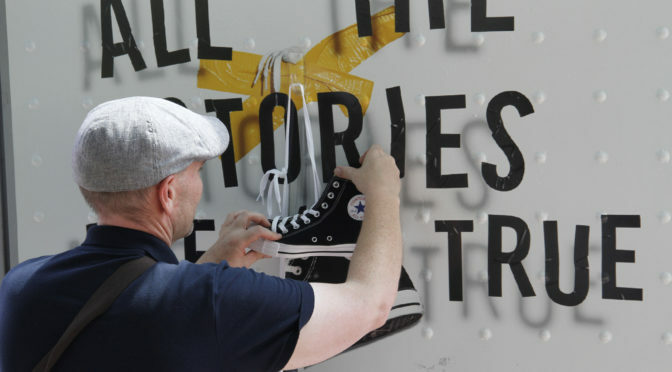 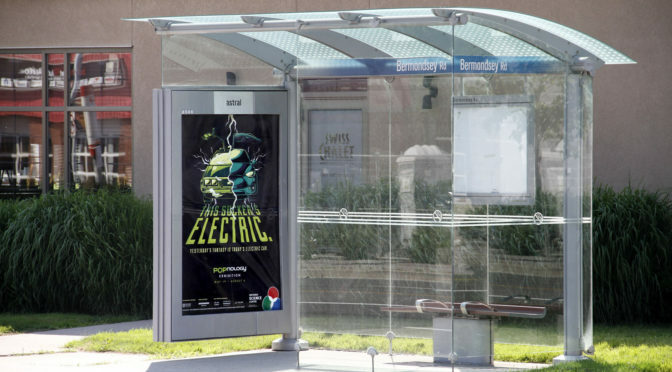 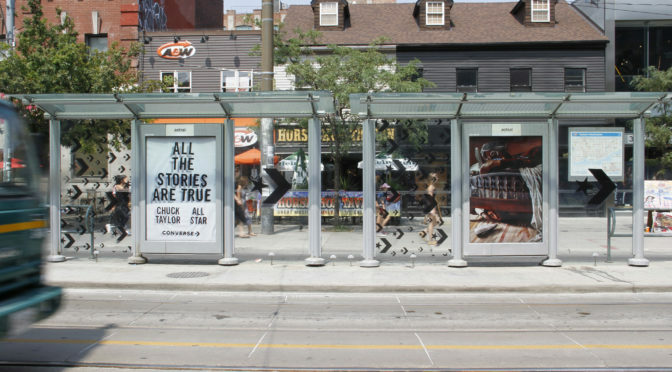 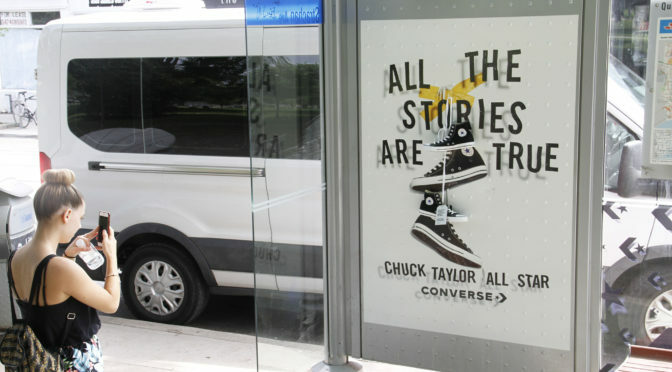 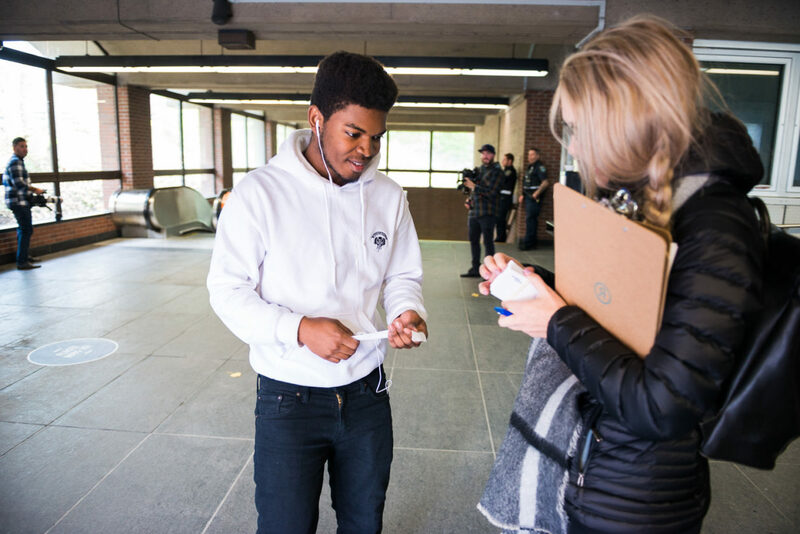 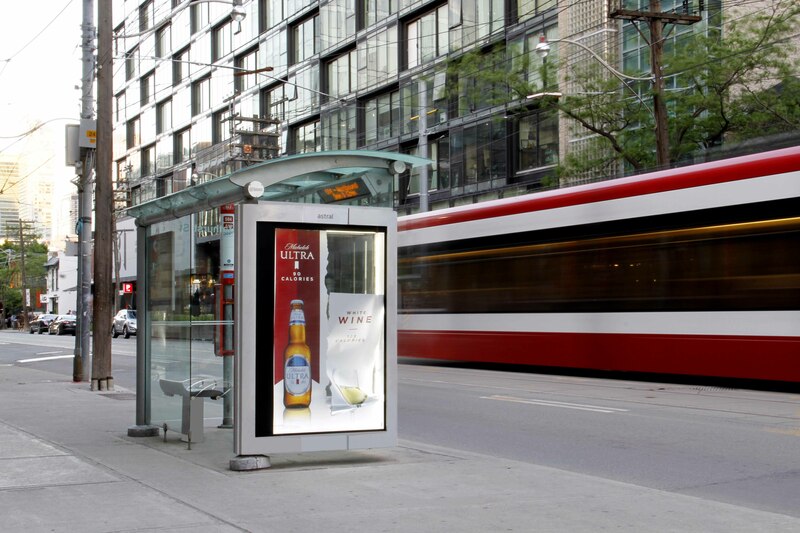 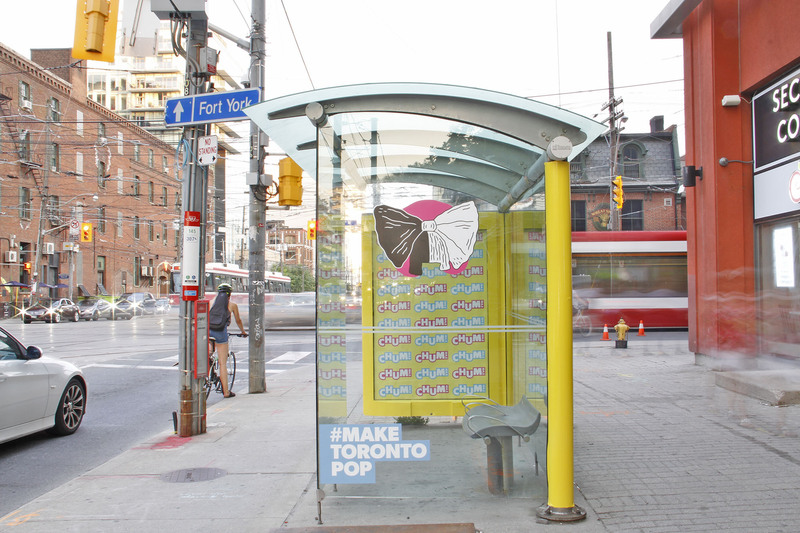 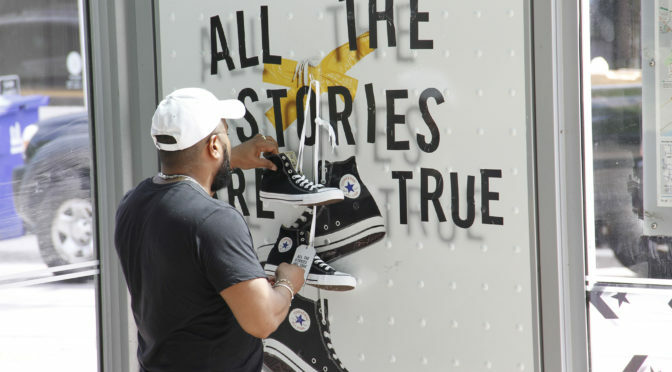 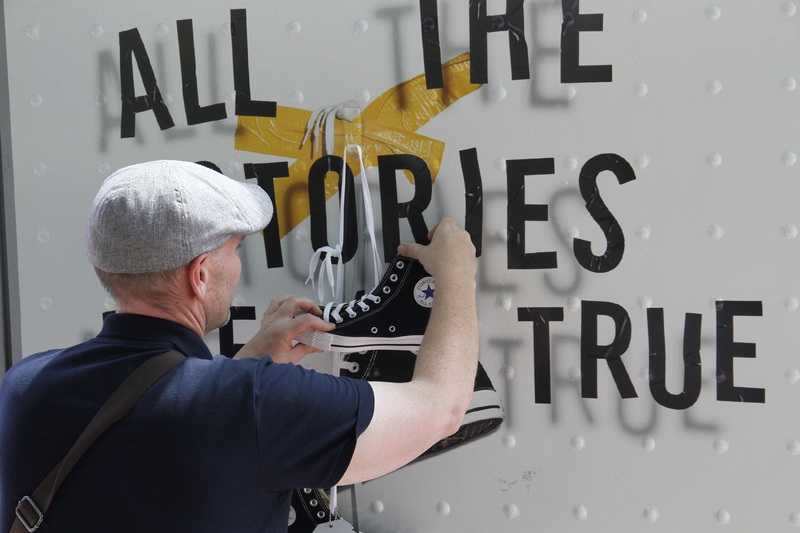 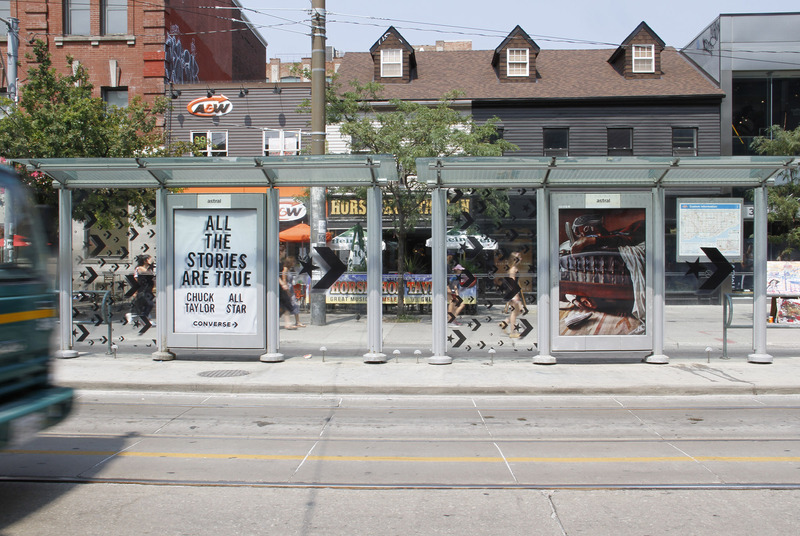 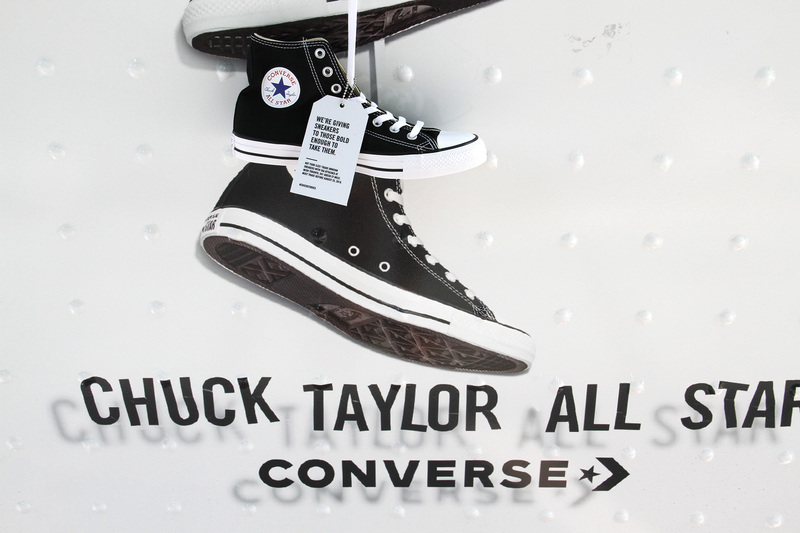 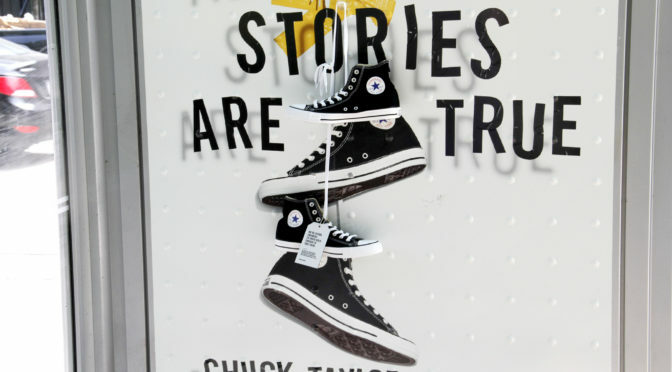 To promote their Chuck Taylor’s brand, Converse gave away free pairs of shoes using Astral Transit Shelters in strategic places in downtown Toronto. 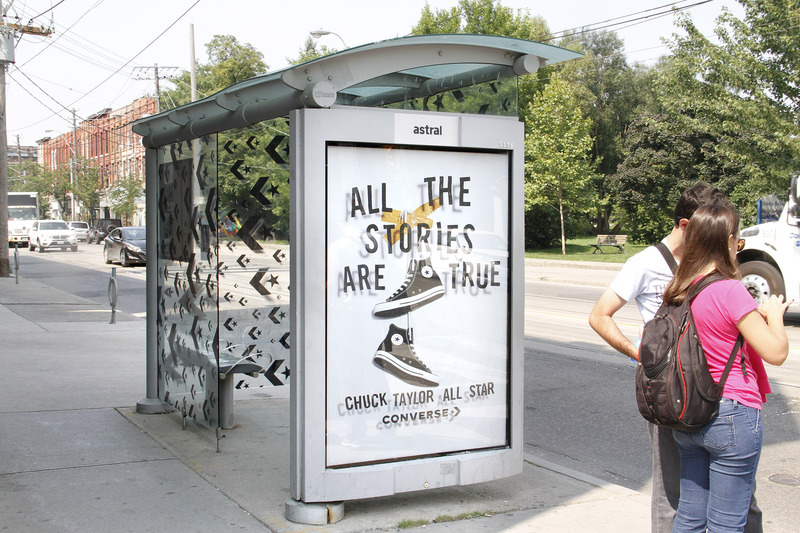 The shoes were hung upon a specially wrapped transit shelter face. 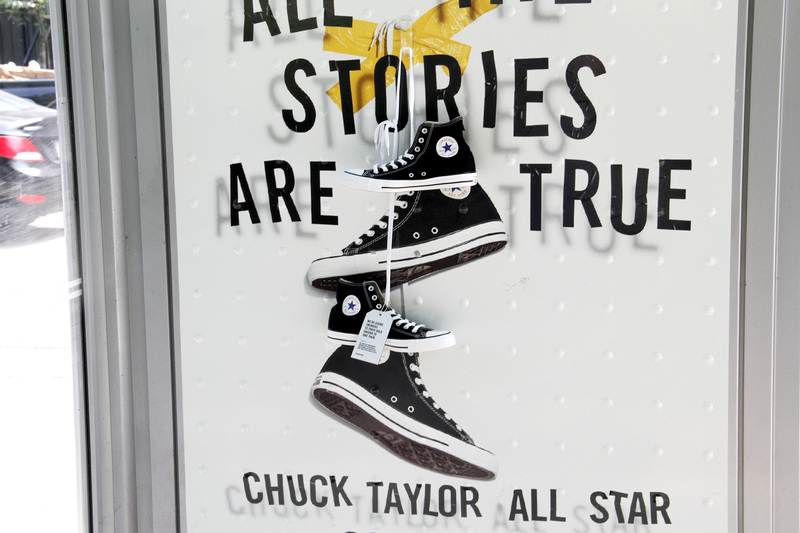 A tag on the shoes indicated to the lucky person where they could exchange them for a different size if needed. 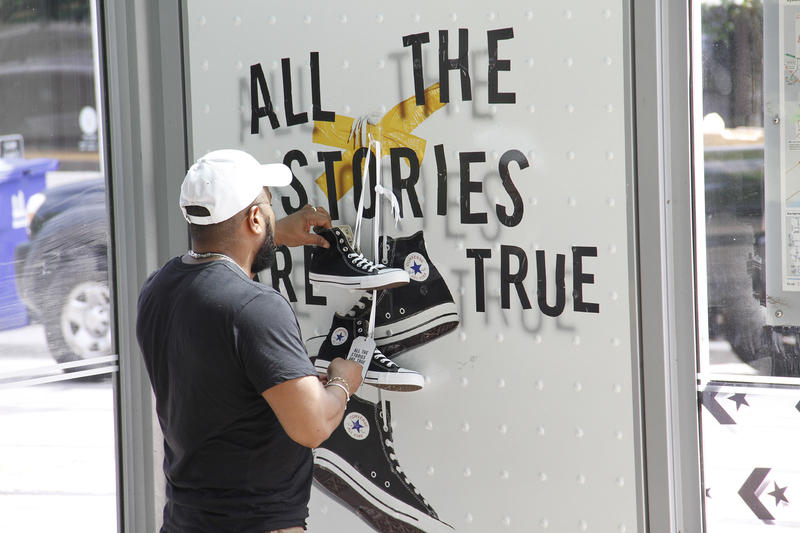 In total, a 100 pair of shoes were given away over a 15 day period at 3 different locations in Toronto. 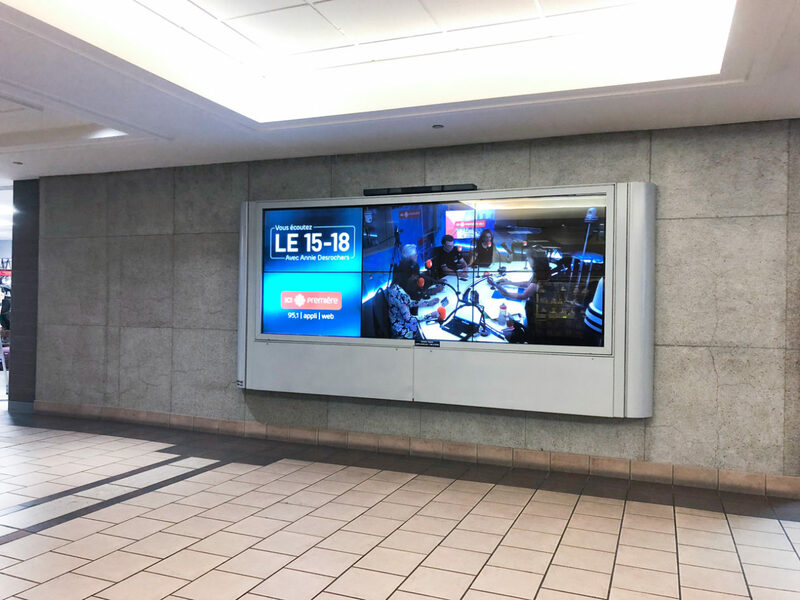 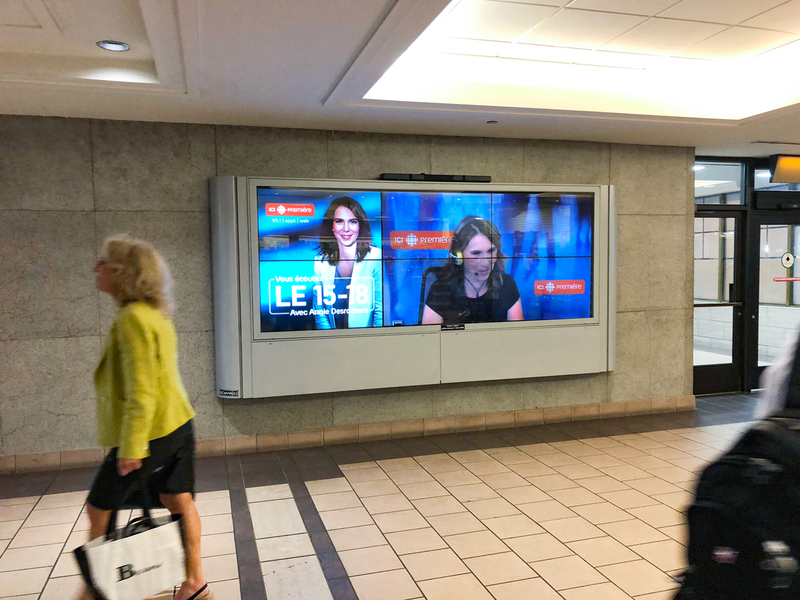 The radio show « Le 15-18 » was broadcast on our video wall via live feed in Montreal’s Central Station. 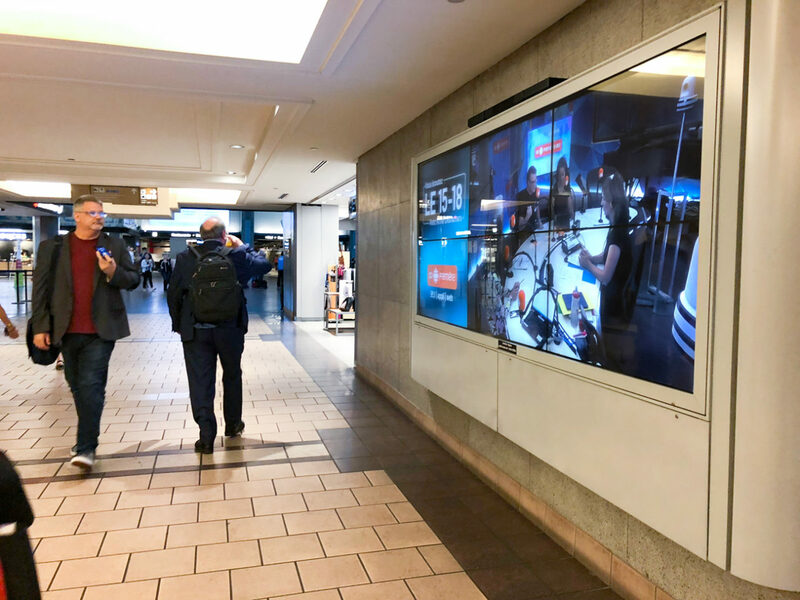 A sound bar was installed so that passers by could watch and listen in real time. 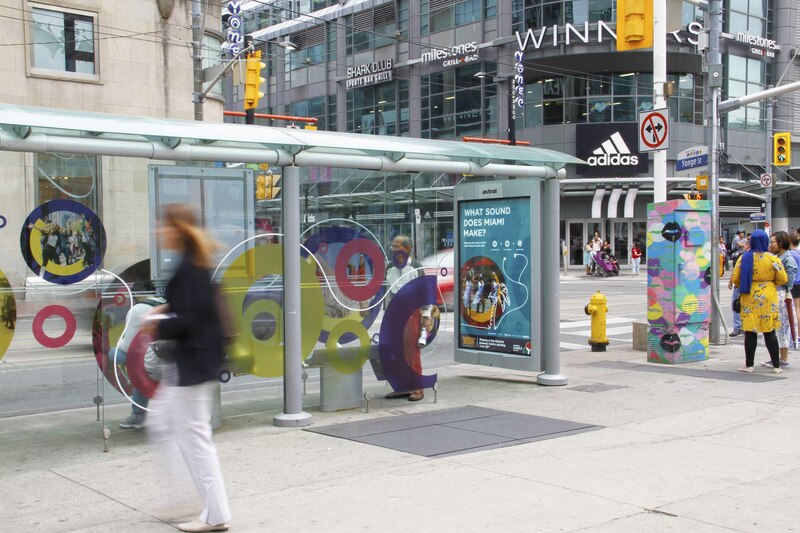 With a new brand image in mind, CHUM 104.5 debuted a bright, colourful campaign putting the city of Toronto front and centre. 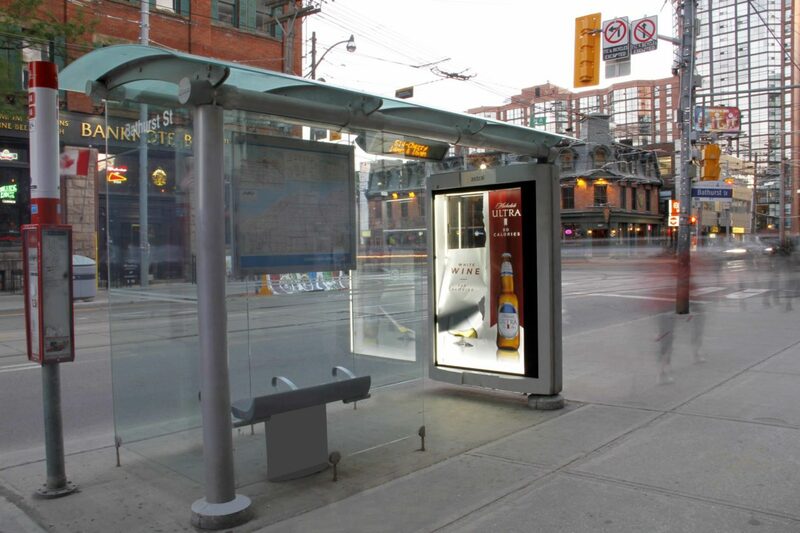 The uniqueness and hipness of the CHUM brand was emphasized with special executions at multiple Astral transit shelter locations within the city. 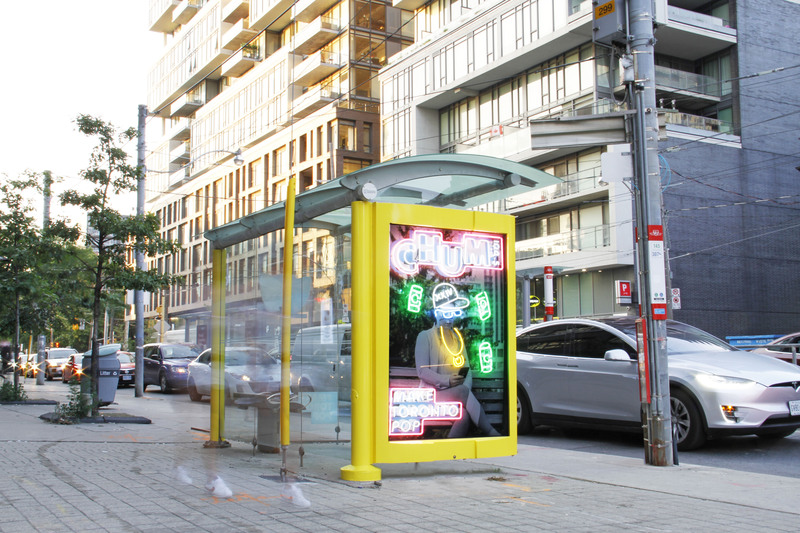 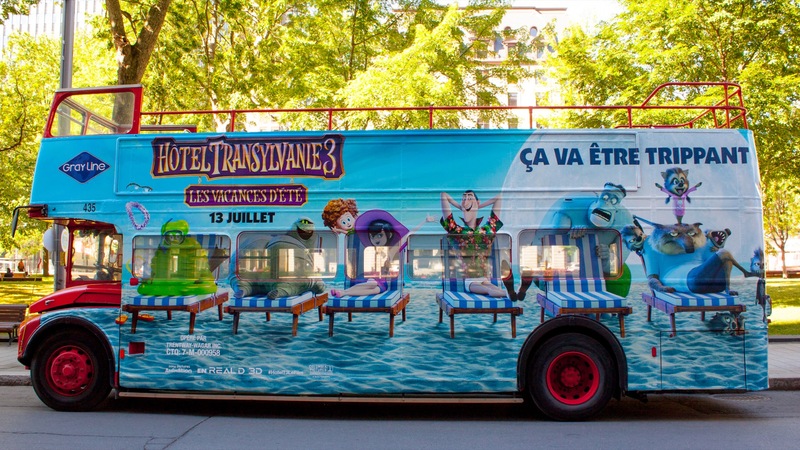 Neon lighting was added to make the campaign “pop” (as its tagline read) and decals wrapped around the ad case while glass showed off the brand’s colourful image. 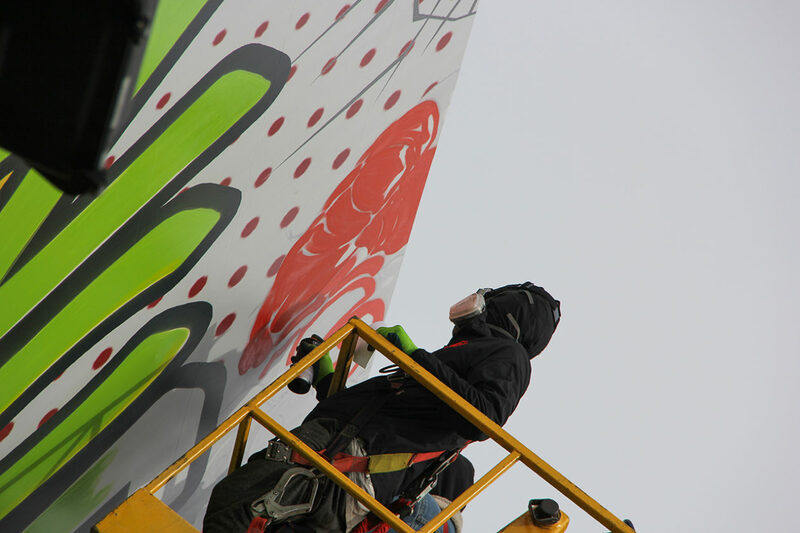 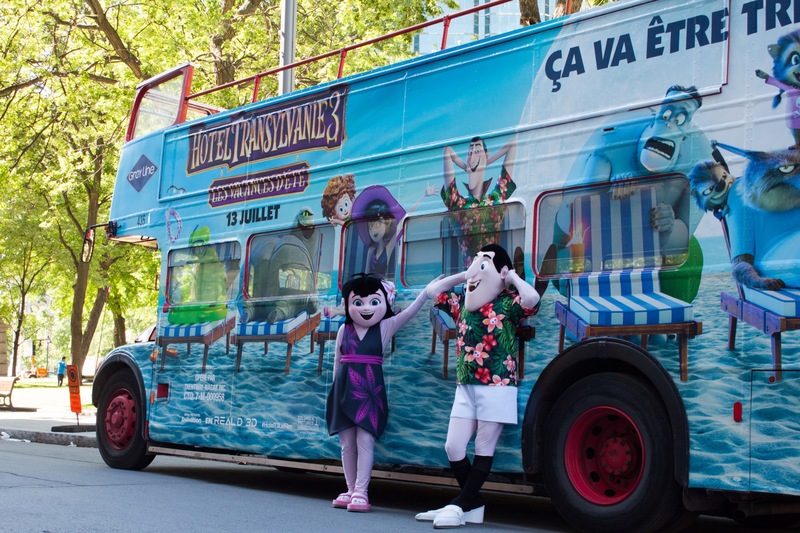 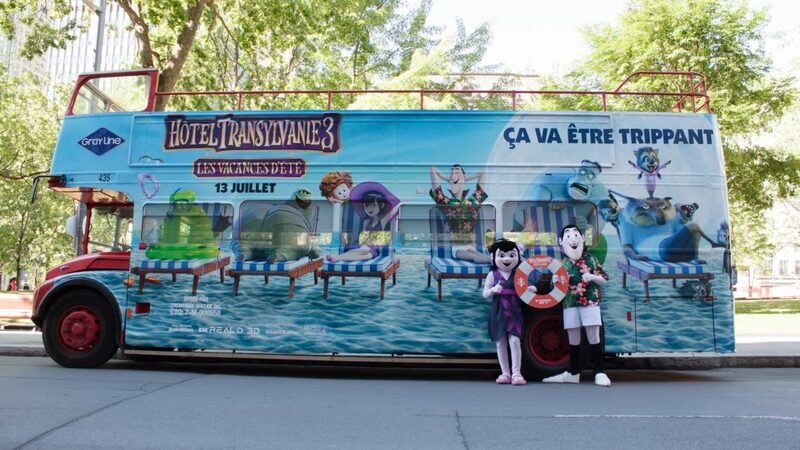 As an added bonus, consumers could take photos of themselves as part of the decals. 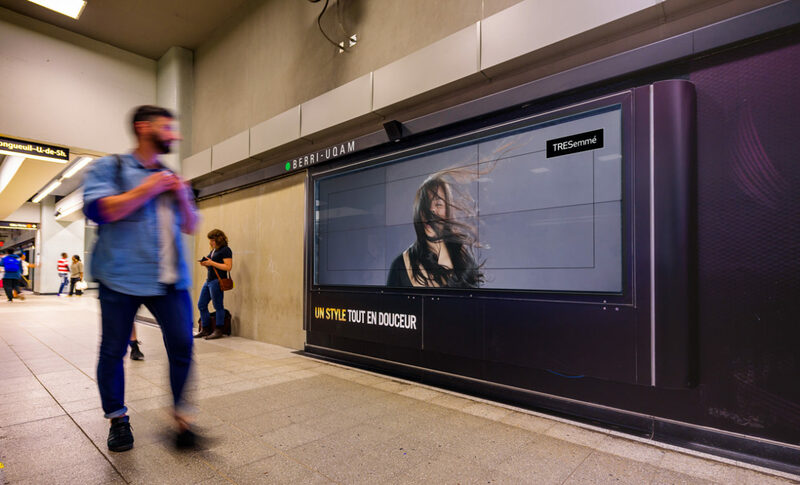 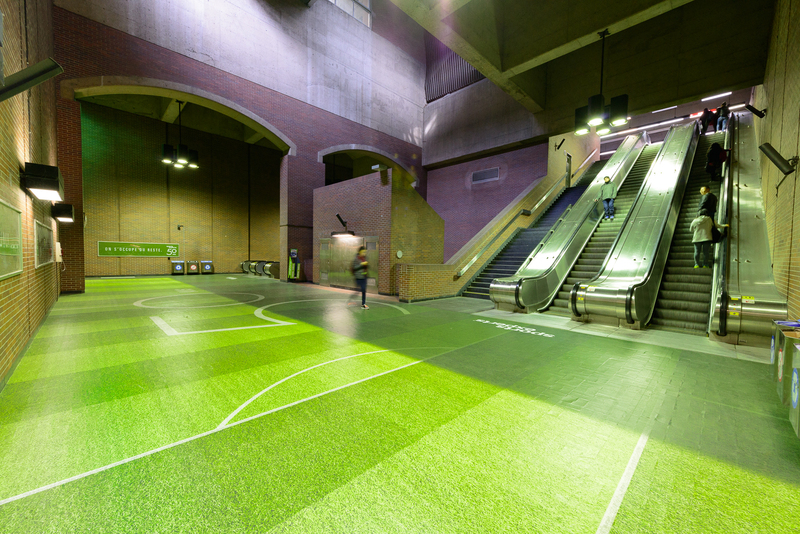 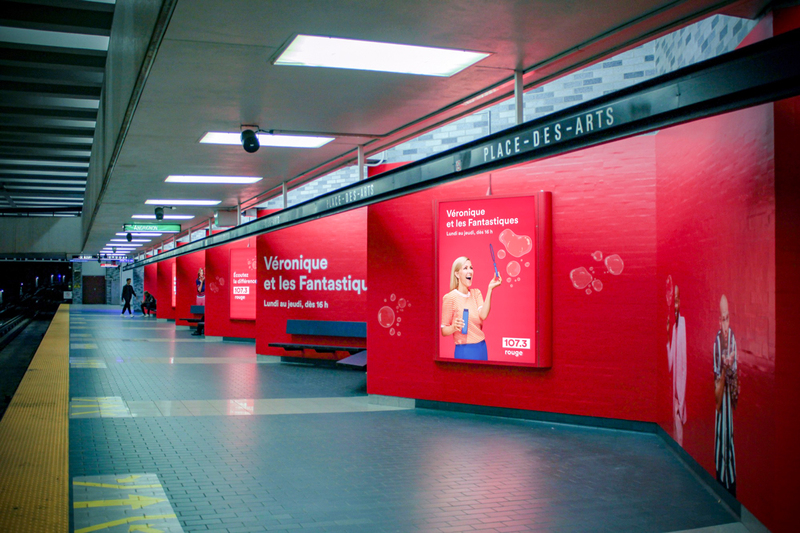 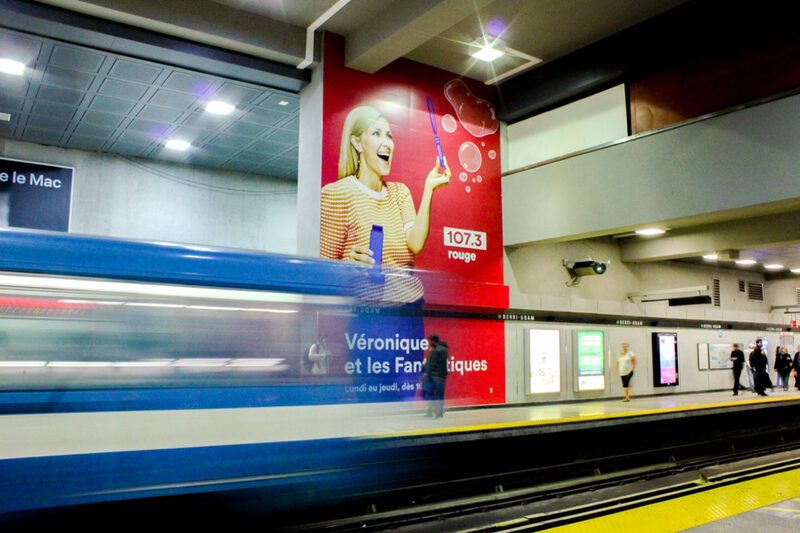 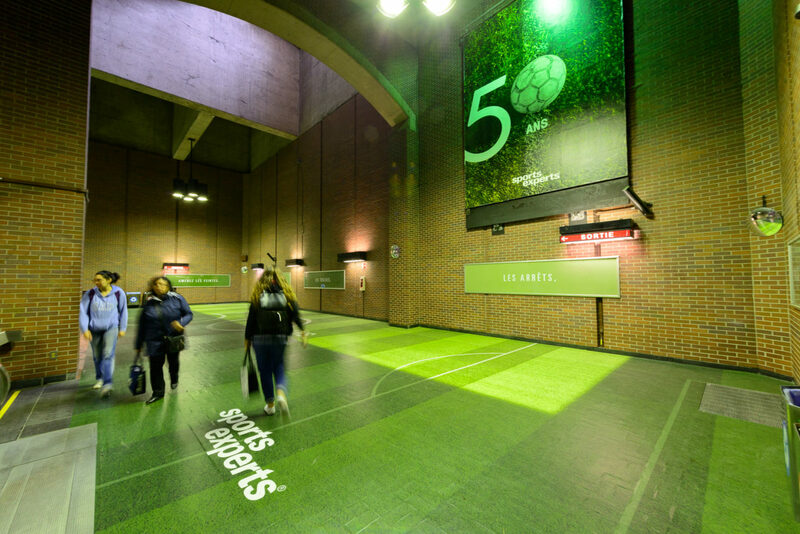 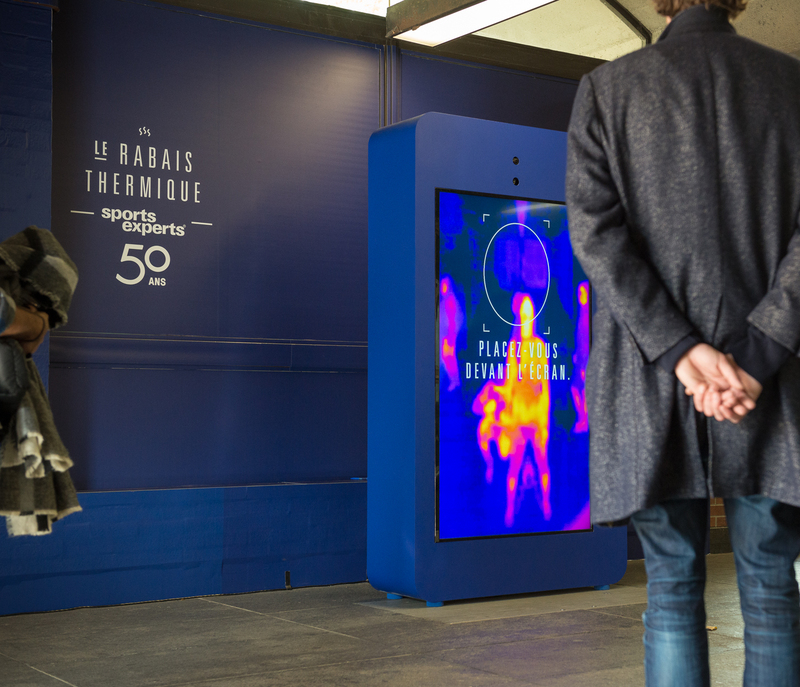 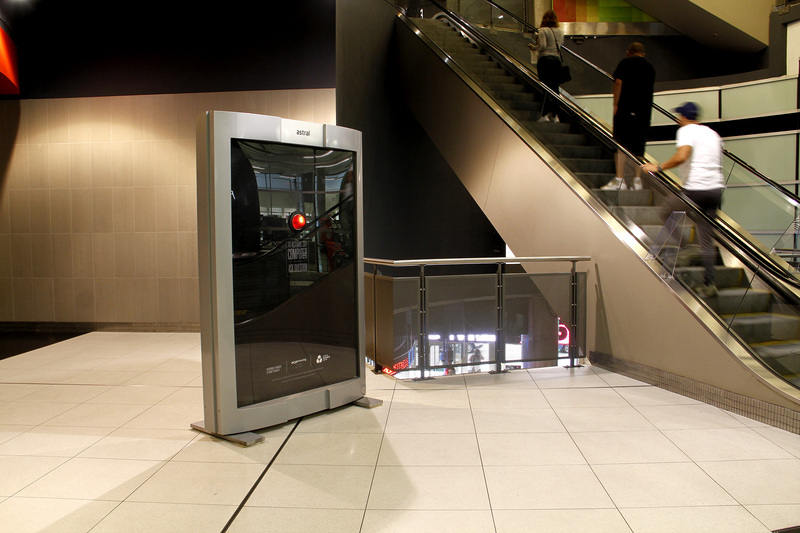 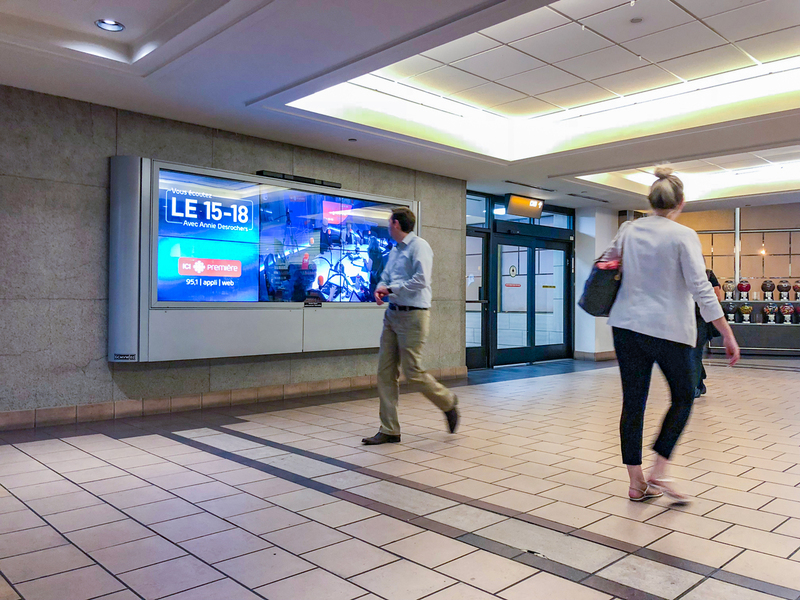 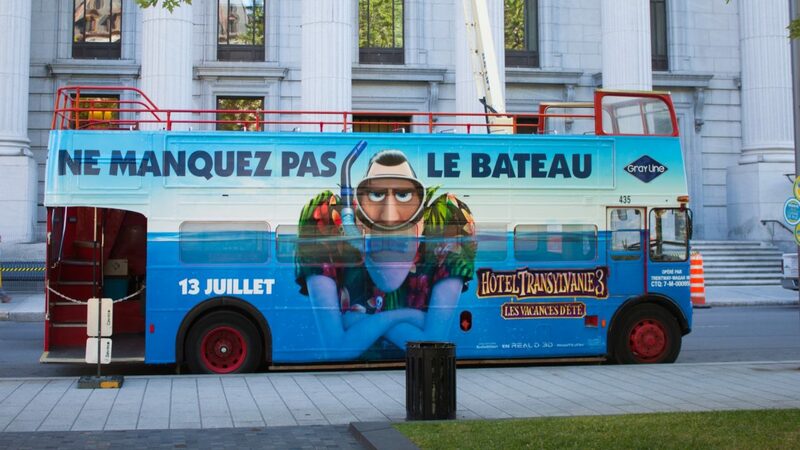 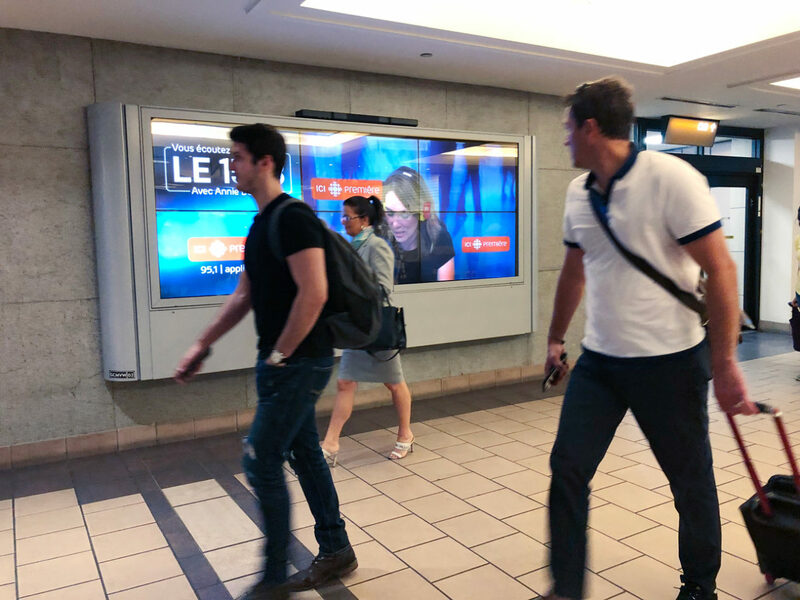 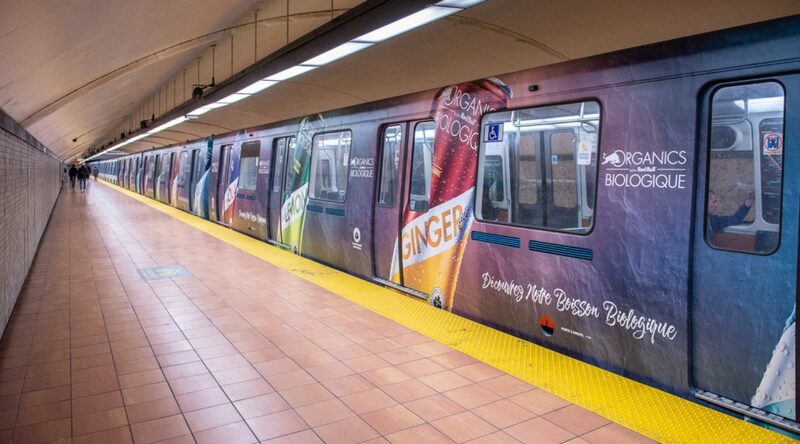 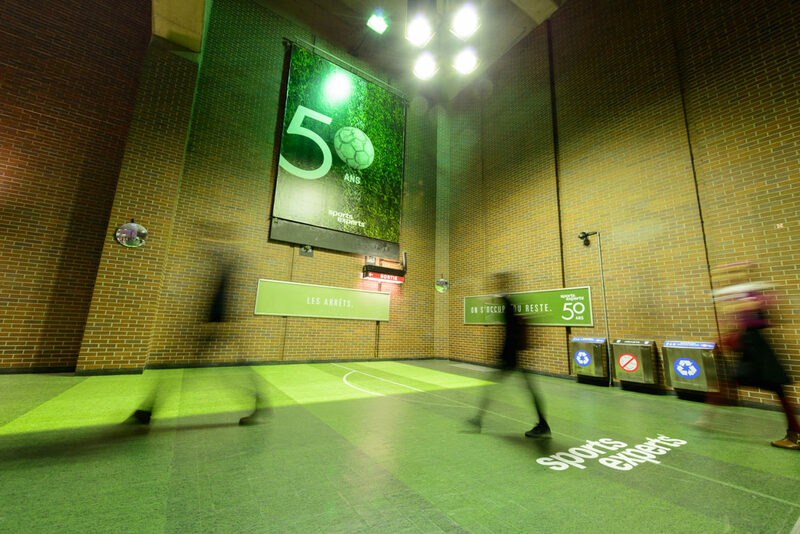 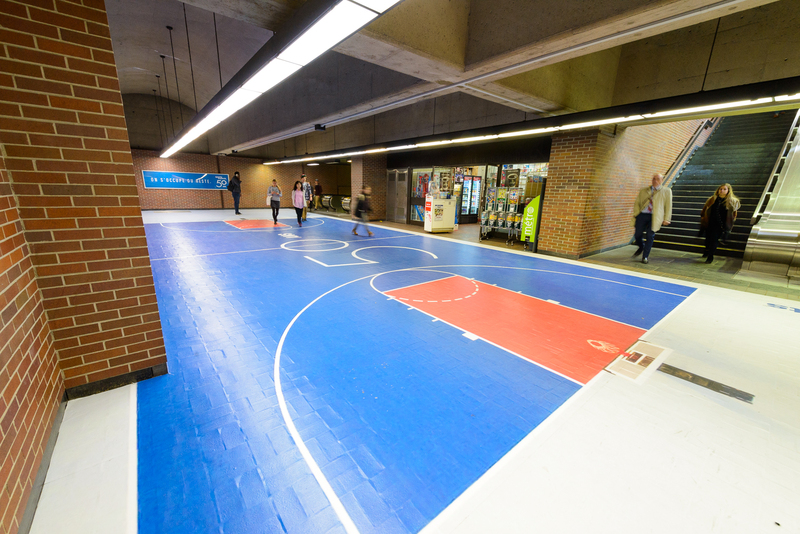 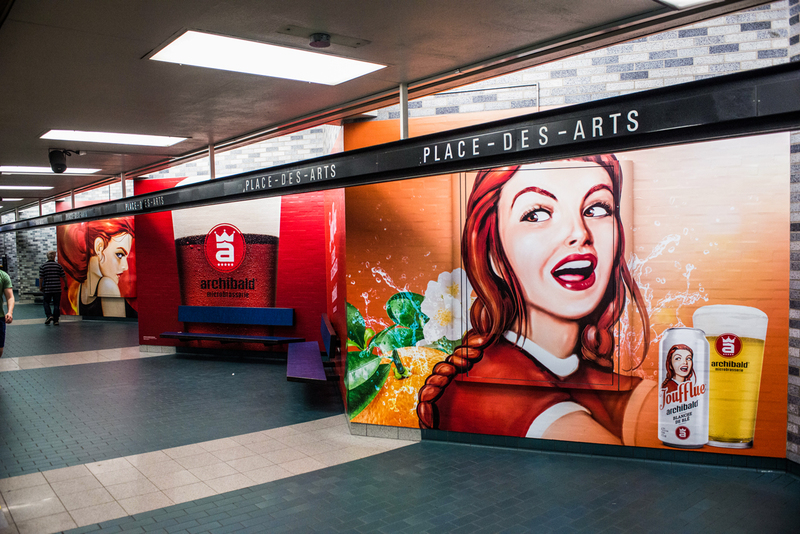 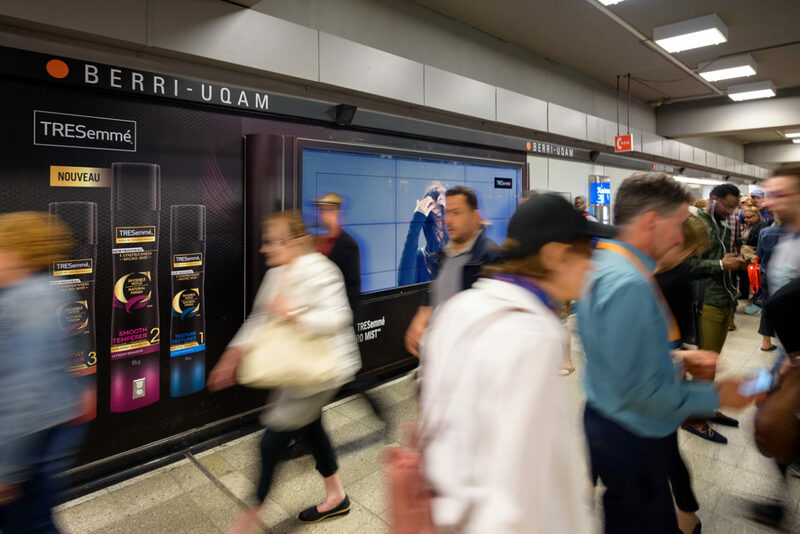 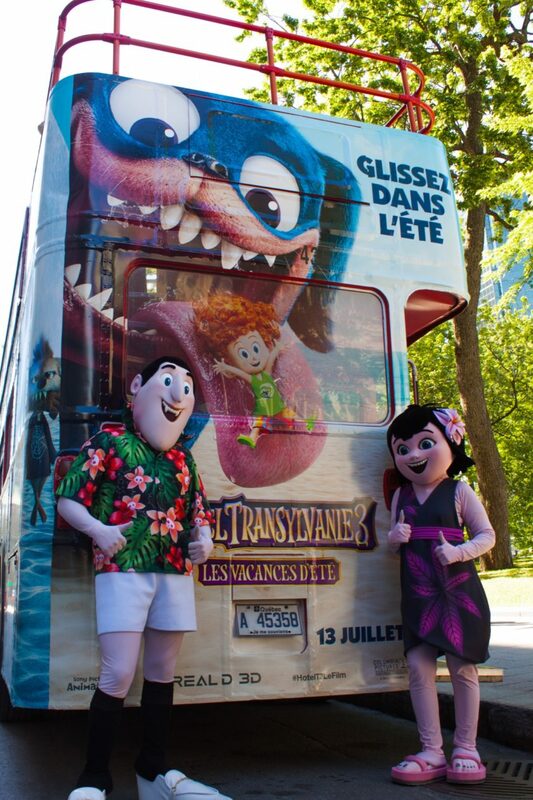 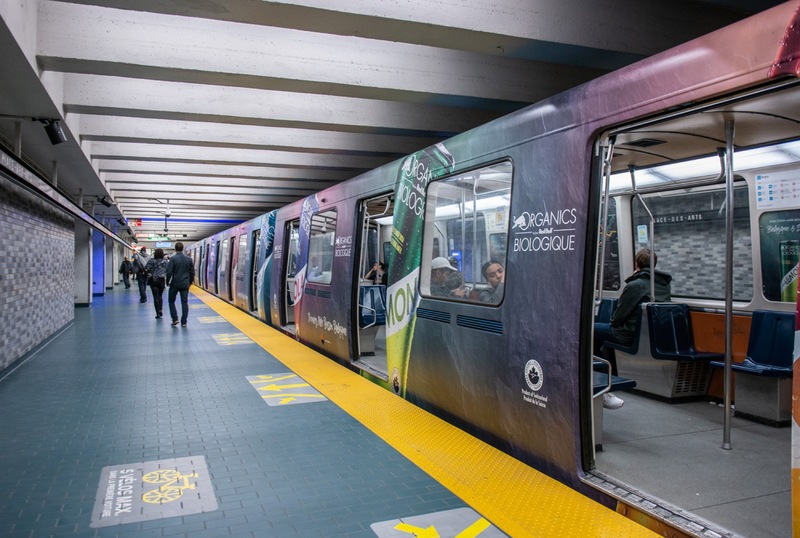 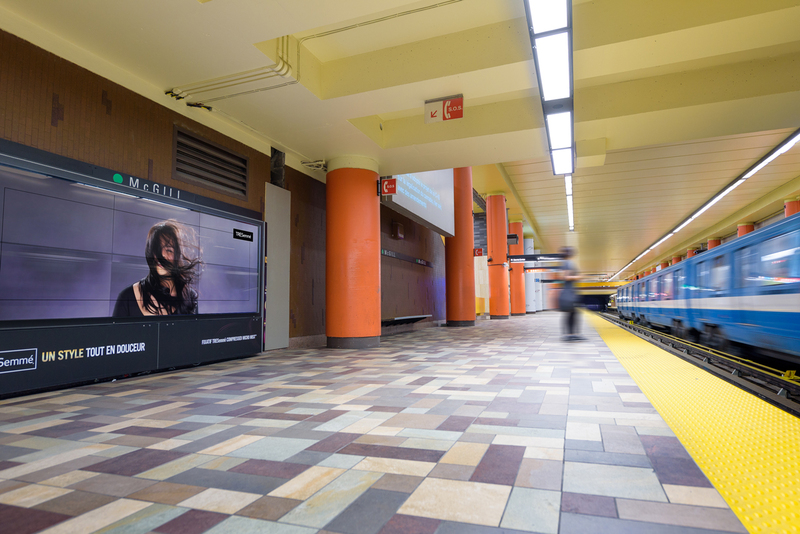 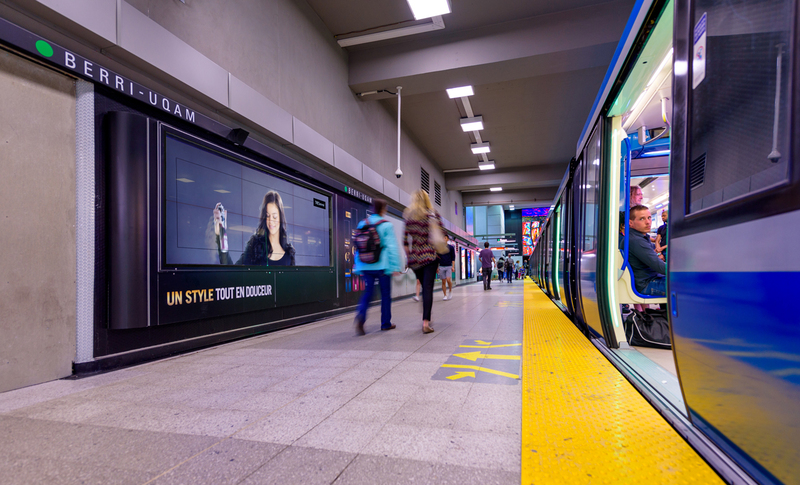 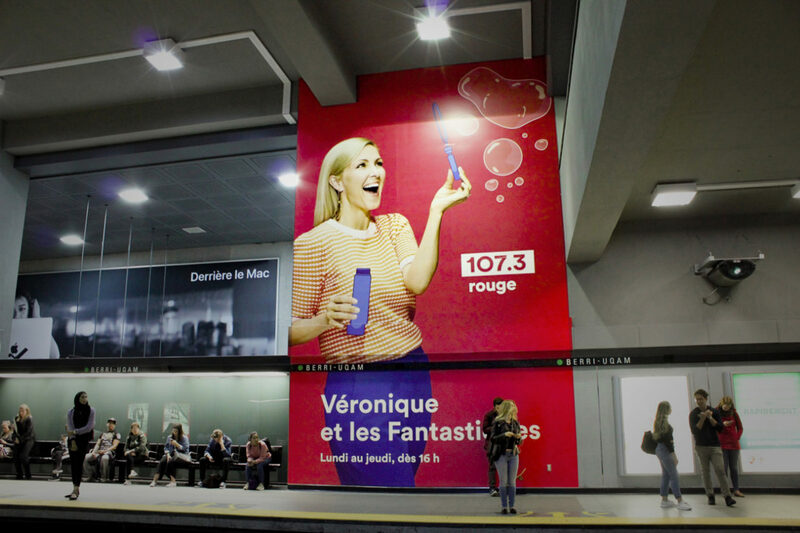 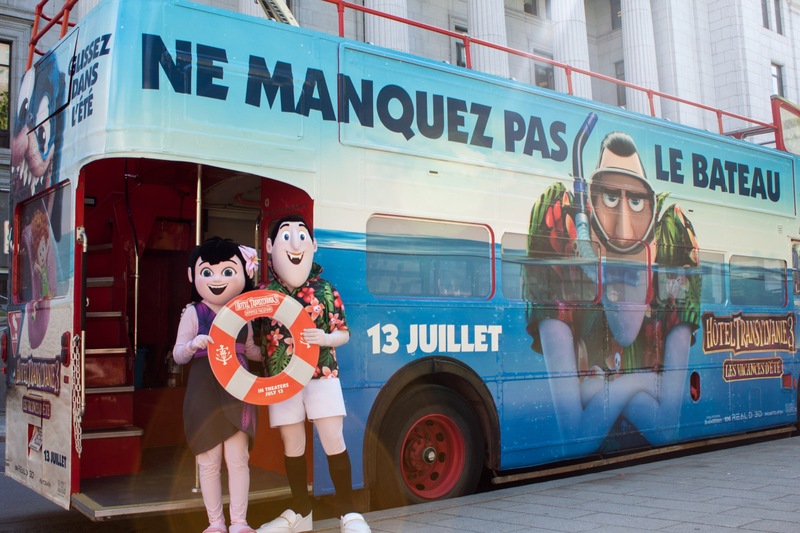 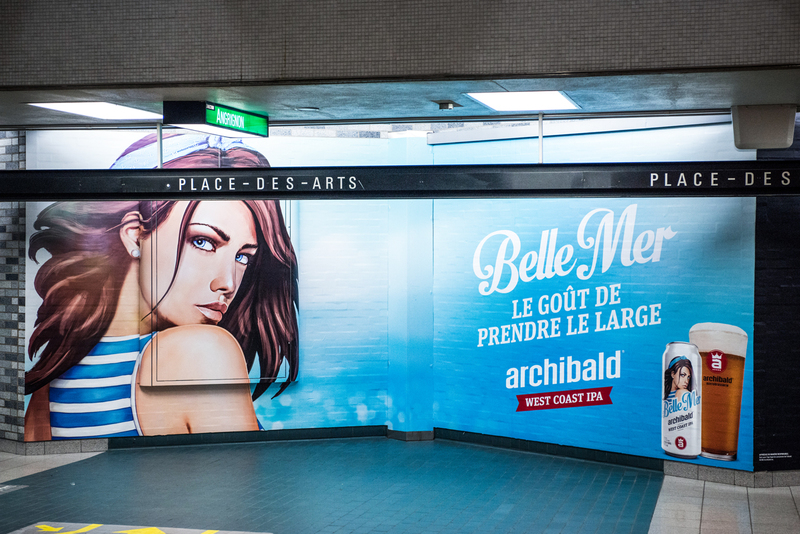 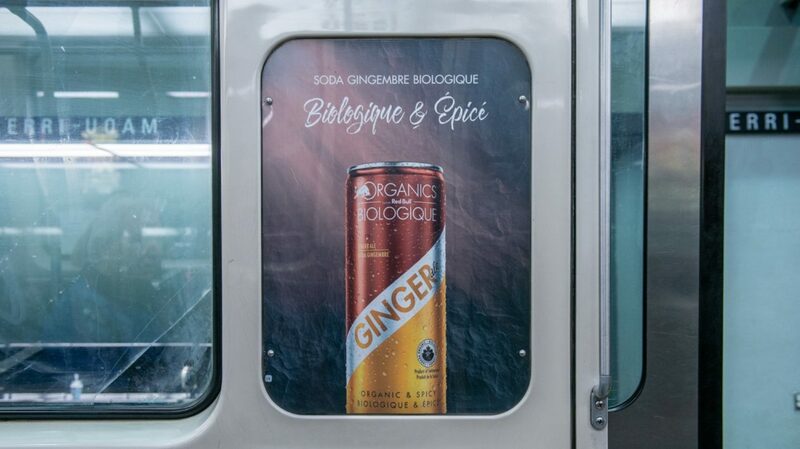 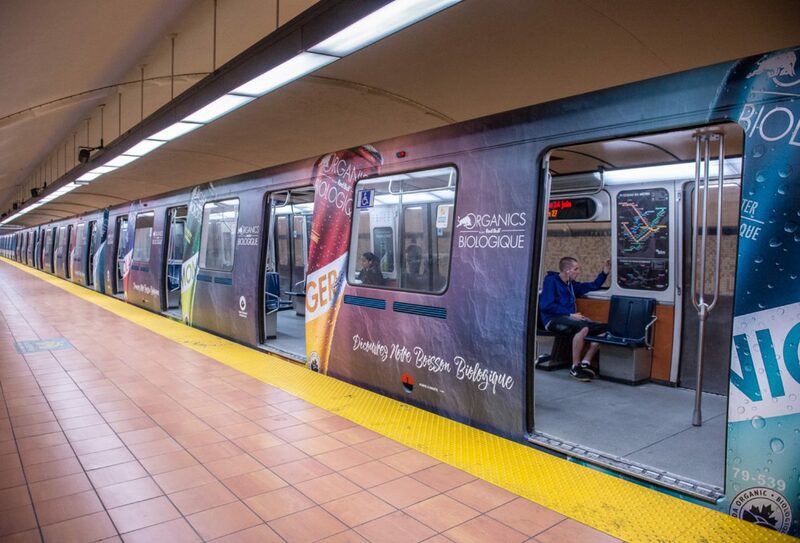 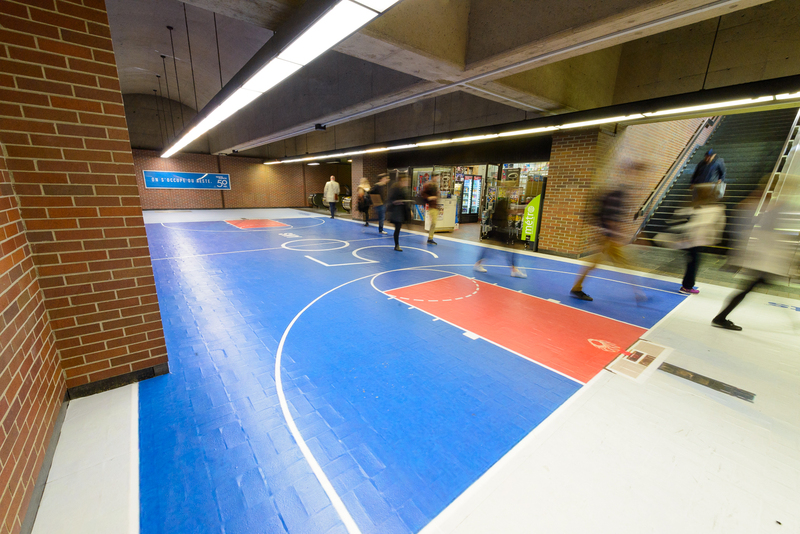 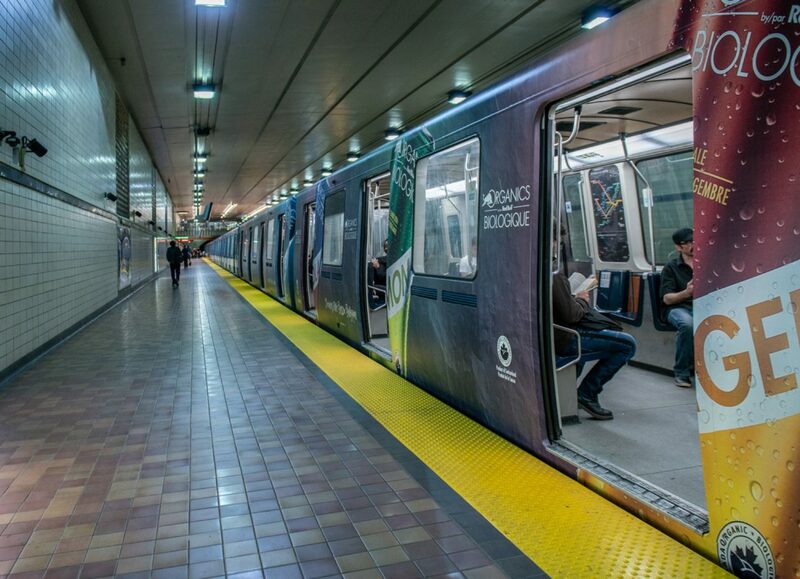 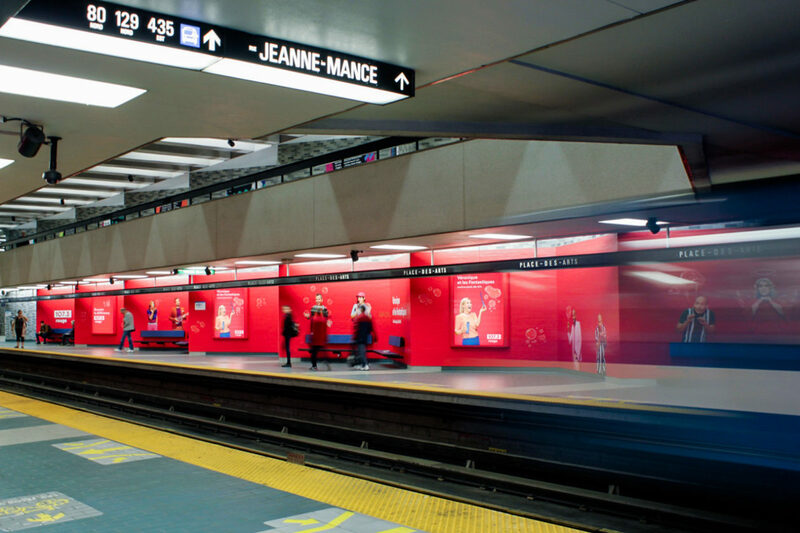 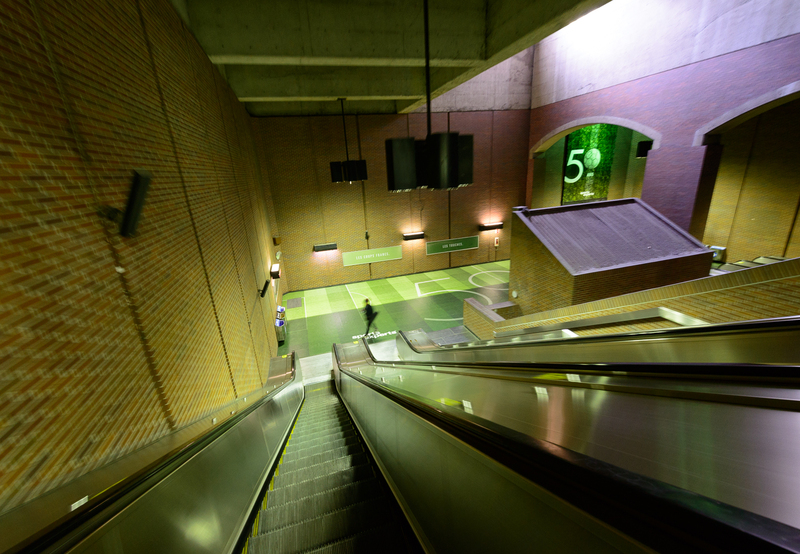 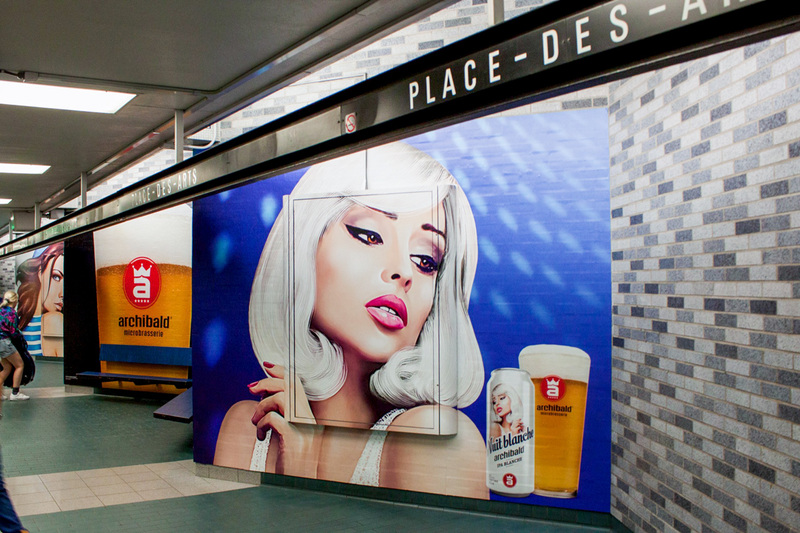 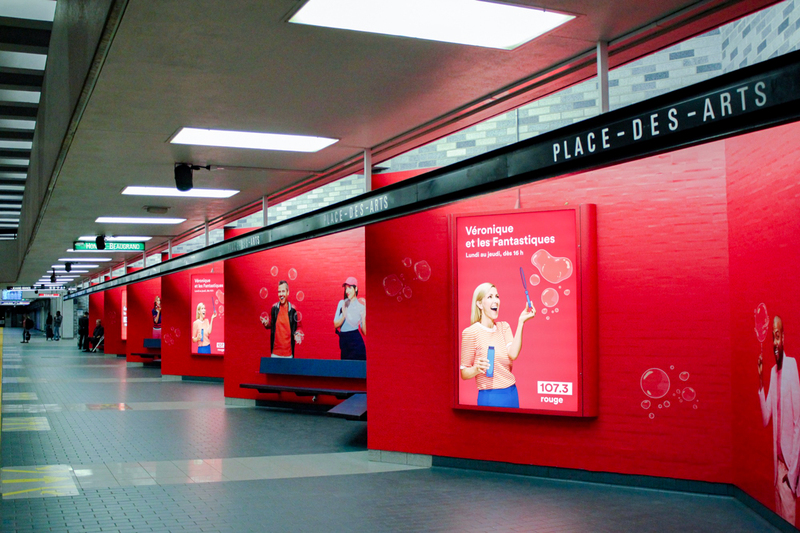 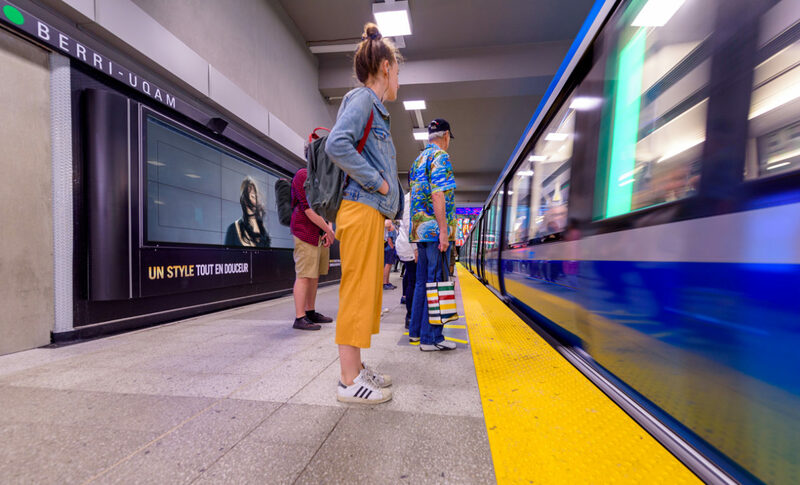 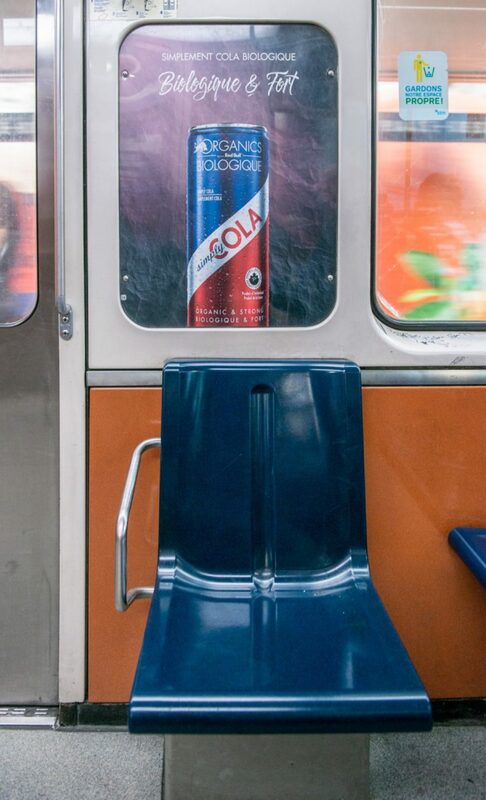 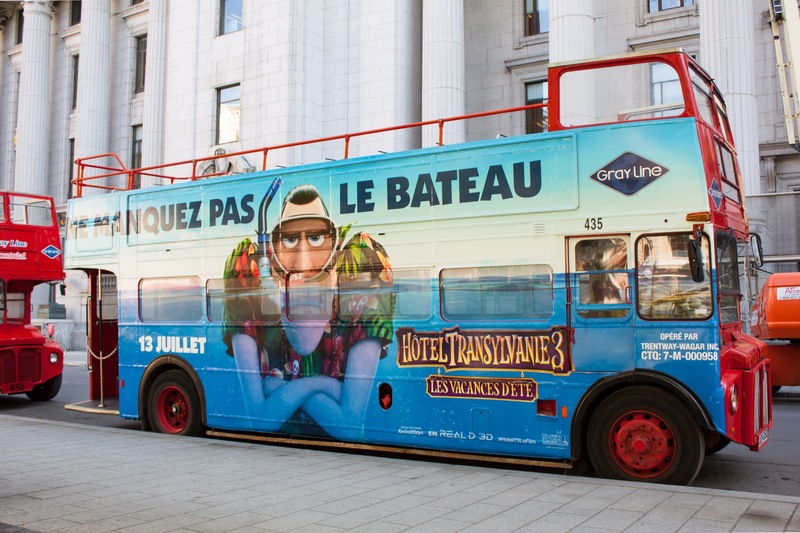 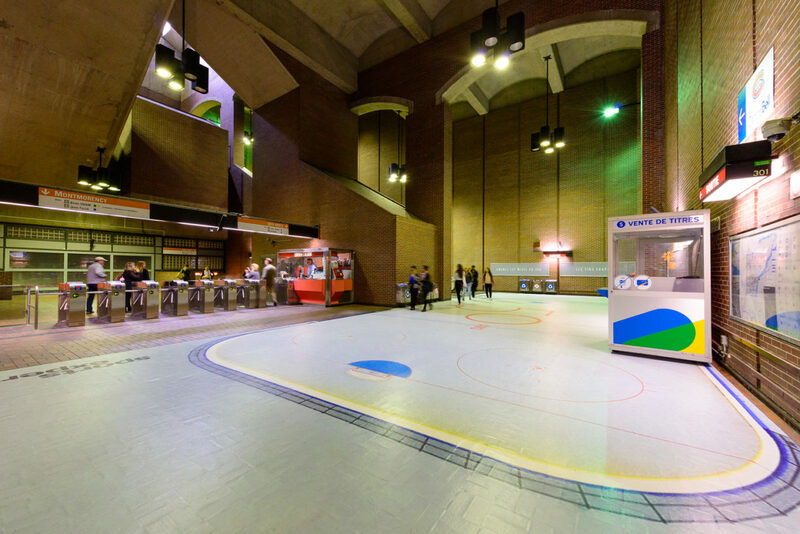 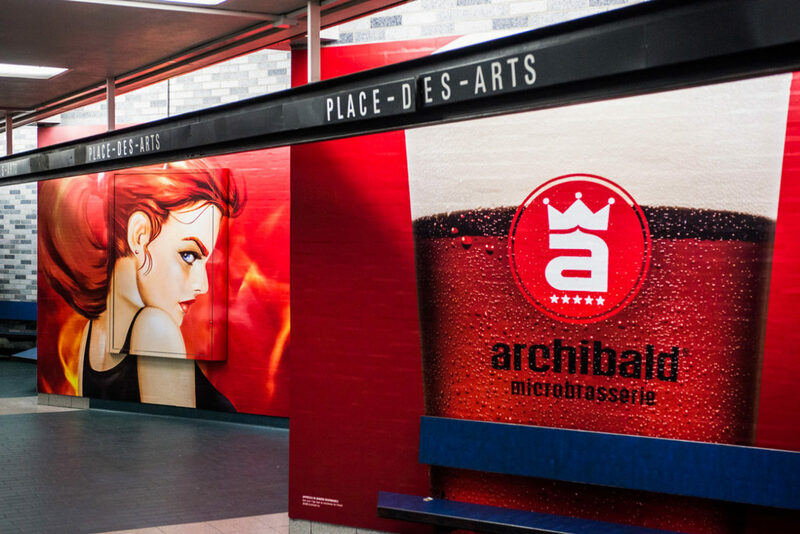 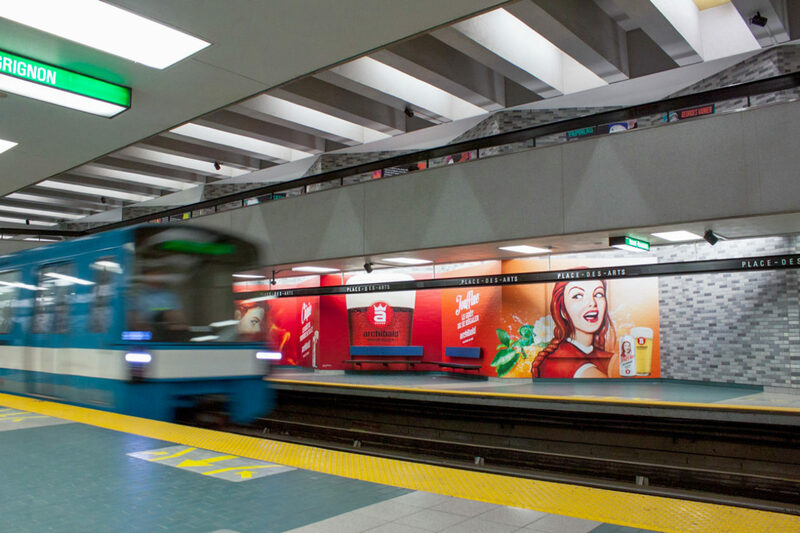 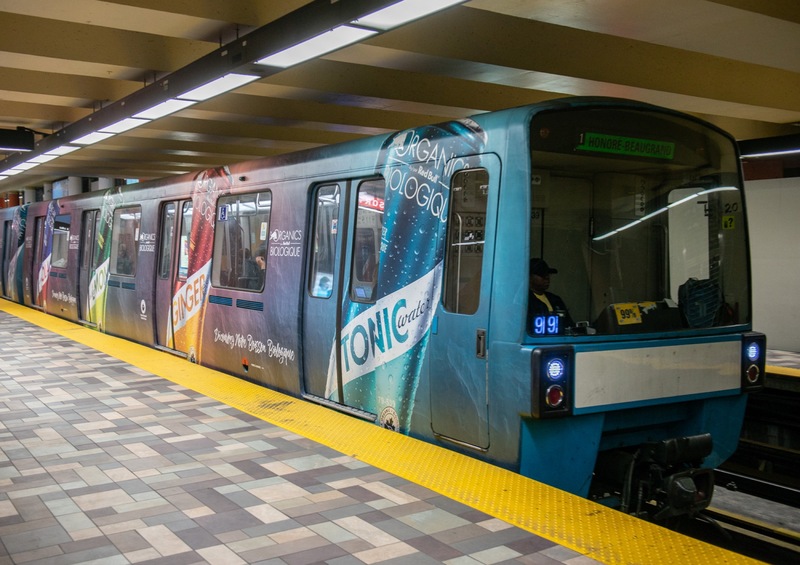 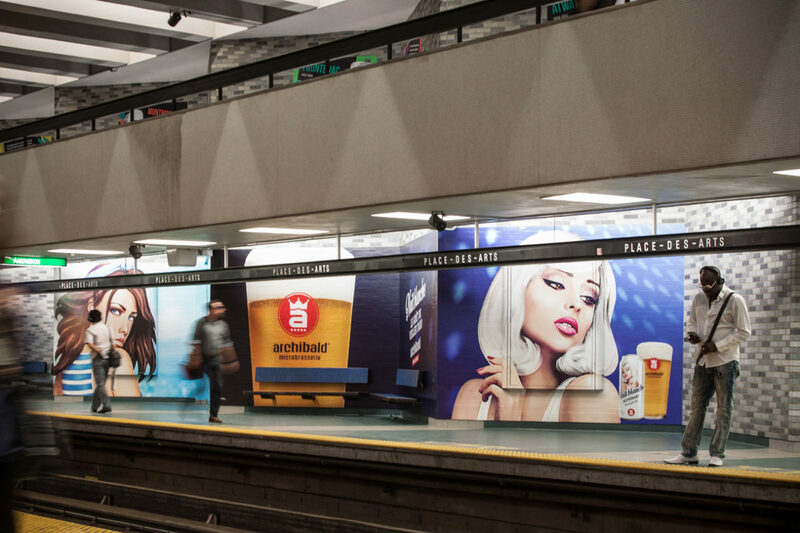 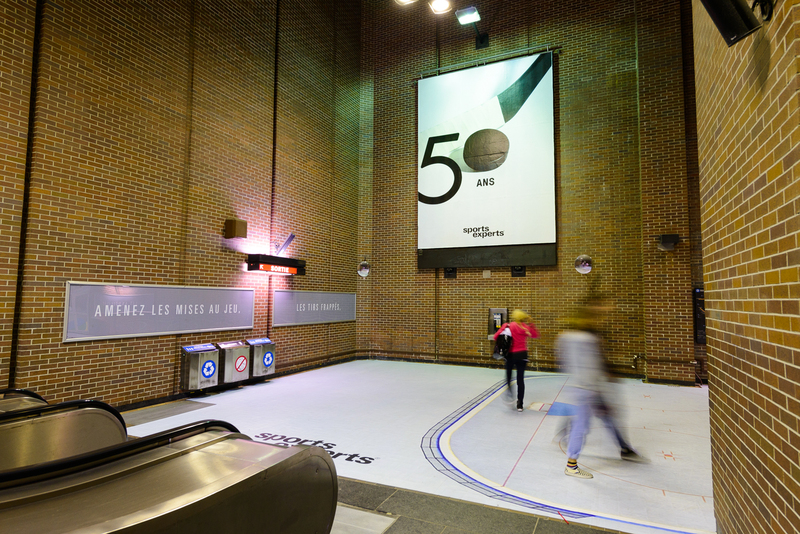 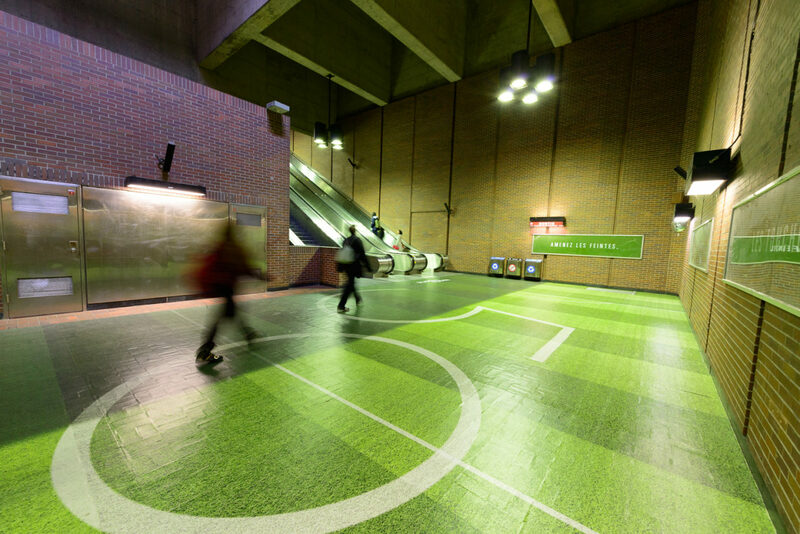 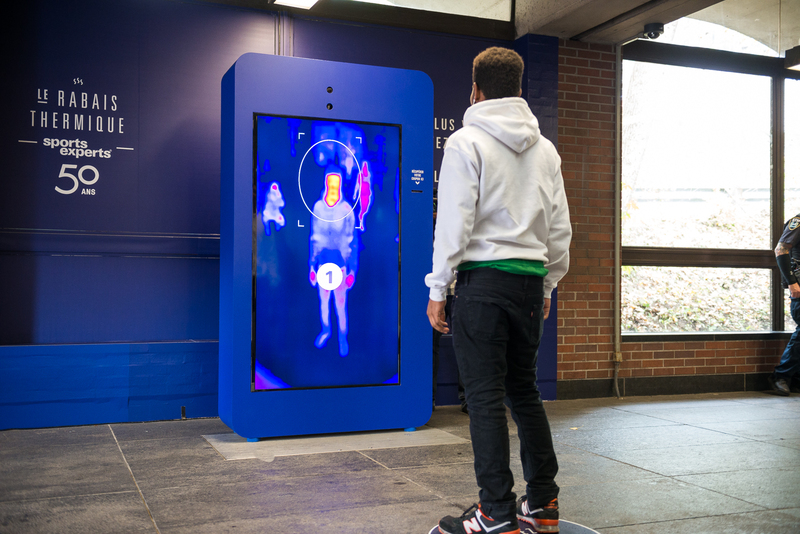 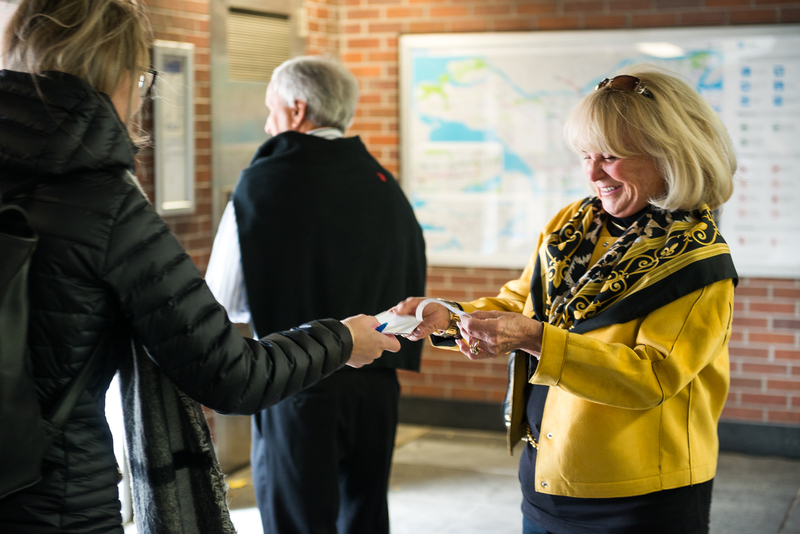 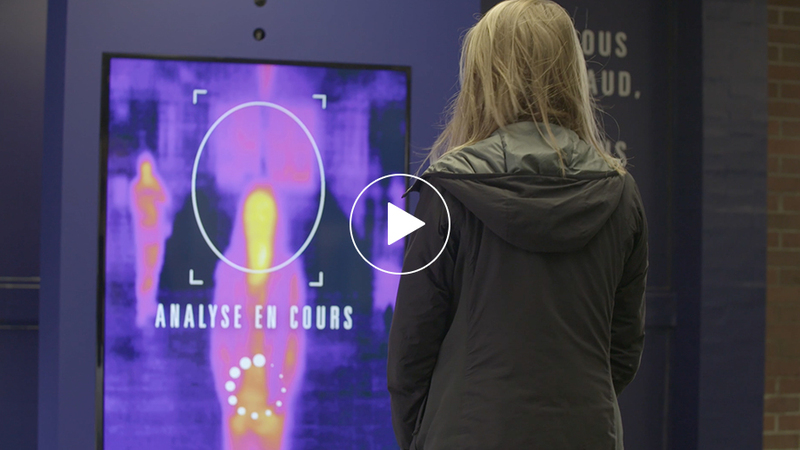 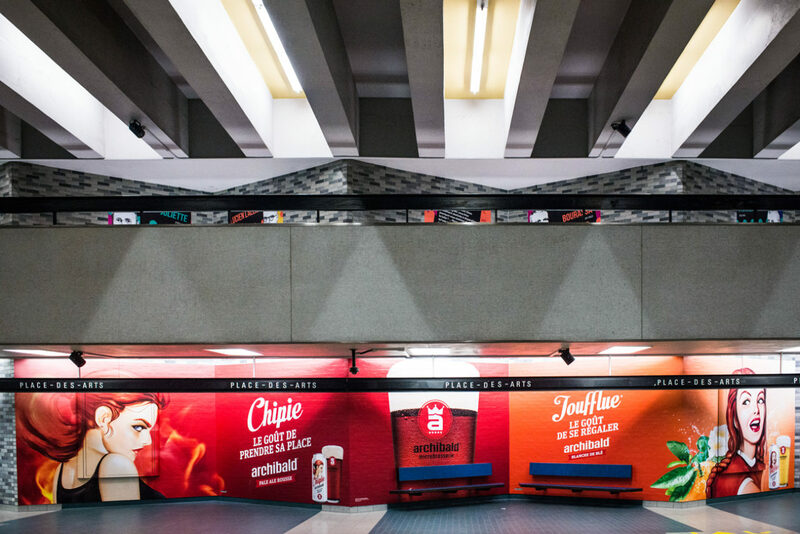 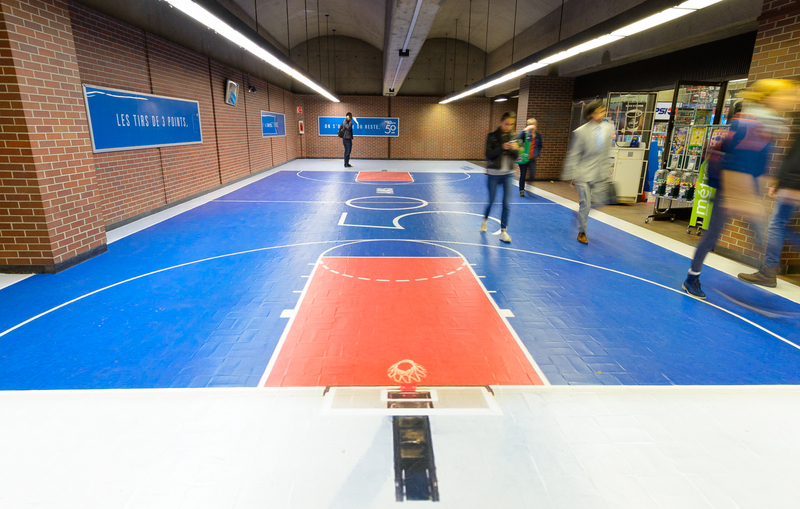 TRESemmé created a dynamic campaign that blew through Berri-UQAM and McGill subway stations in Montreal. 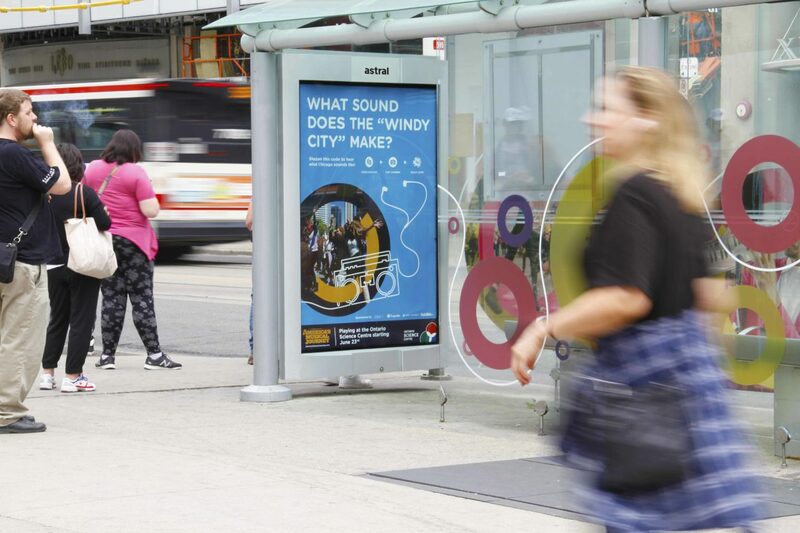 Two wind sensors were installed on the subway platform to record the speed of the wind in the tunnel. 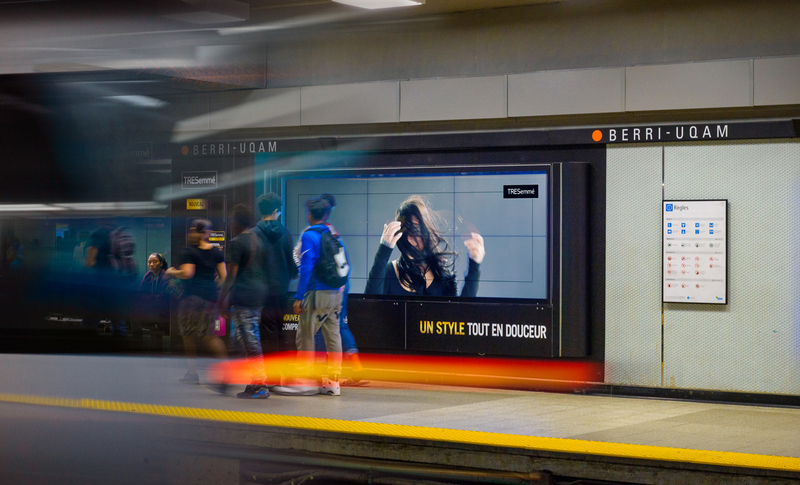 The windspeed would then activate a video of the TRESemmé ad, showing the model’s hair blowing in the breeze caused by the incoming train. 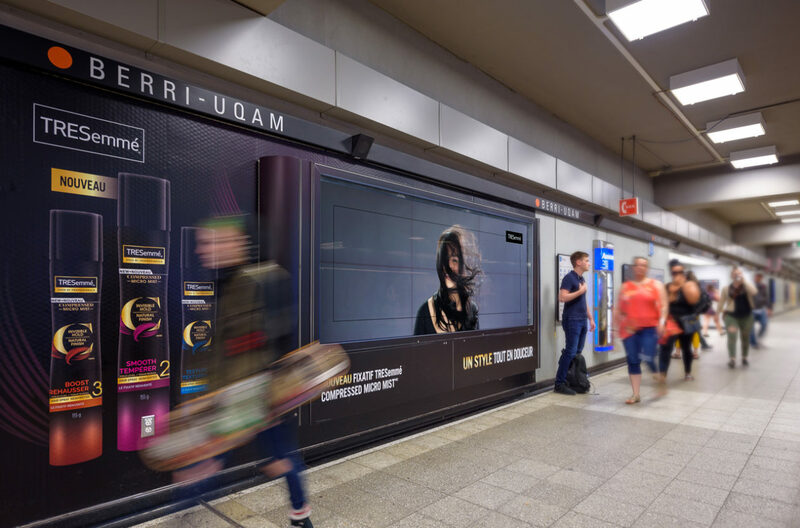 TRESemmé wanted to promote the strength of their new range of hairspray, which holds hair in place even after exposure to strong winds without losing its shape. 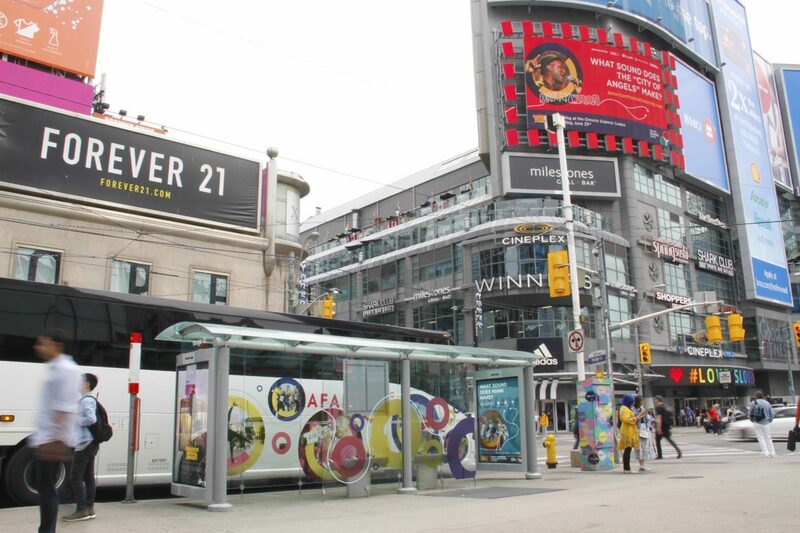 To promote the release of the film “America’s Musical Journey” at the Ontario Science Centre, Brand USA wrapped Astral’s largest transit shelter at Dundas Square with bright visuals. 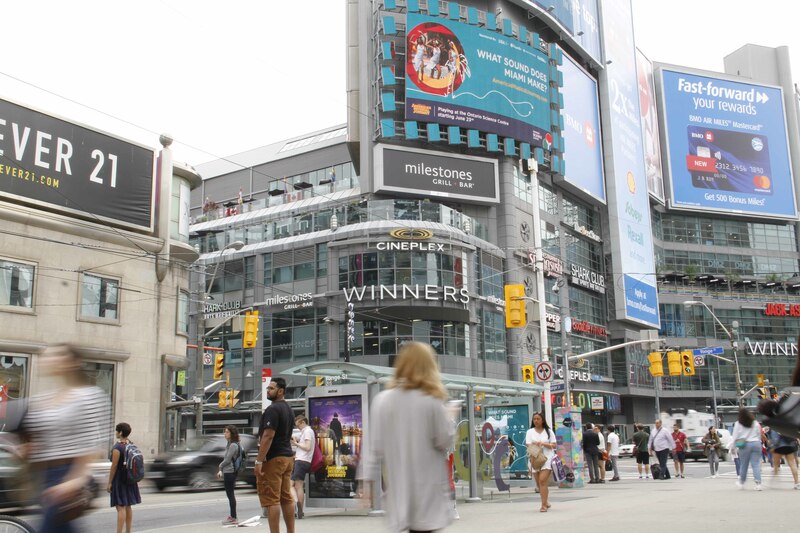 The video screen at 10 Dundas was also used in addition to live musical talent that drew curious pedestrians in.